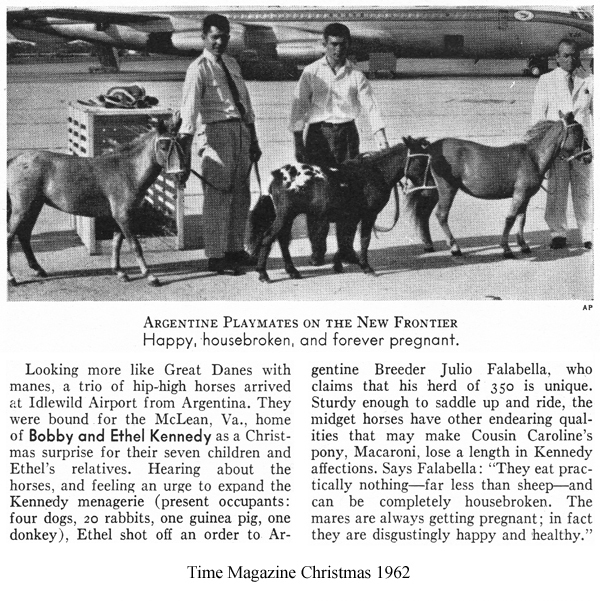 The late Julio Cesar Falabella began to export horses in the 1960’s and in those days they were usually sent without pedigrees. 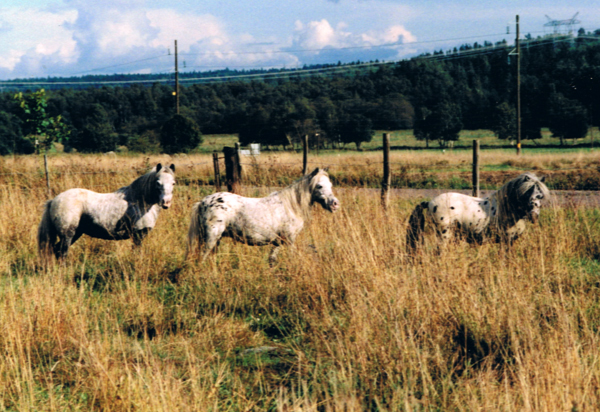 Years later these horses and their progeny were re-inscribed into The Asociacion de Criadores de Caballos Falabella. 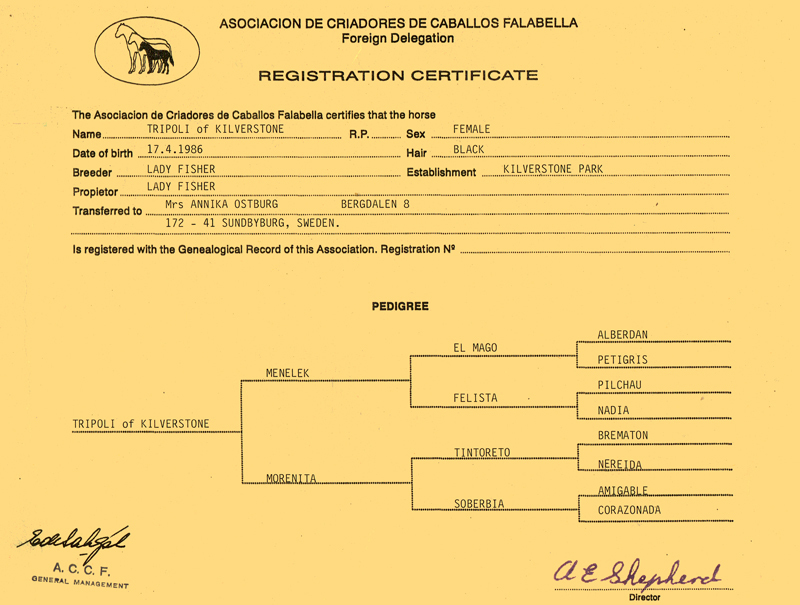 During the 1990’s the ACCF left no stone unturned in order to be certain that the horses re-enrolled were unquestionably original exports from Establecimientos Falabella and their direct descendents. 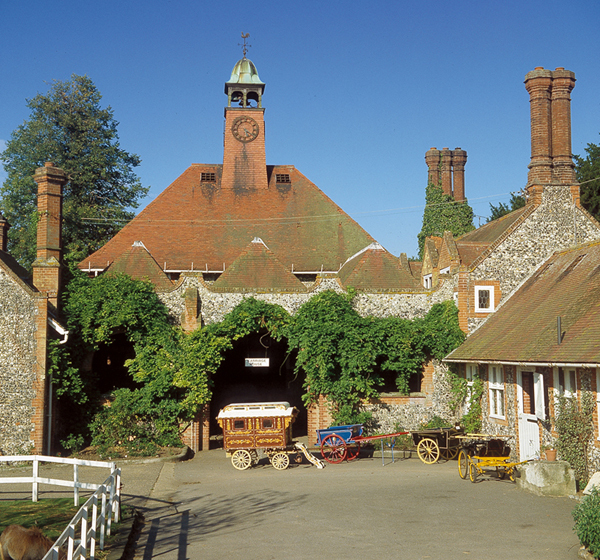 Re-enrollment began in 1991 and went on for seven years but at the end of this time, only a tiny handful of horses had been re-enrolled. It became apparent that the ACCF would not accept exports from anywhere other than their own ranch. Most of the Falabellas in the UK had come via the USA and were therefore not accepted by the ACCF. 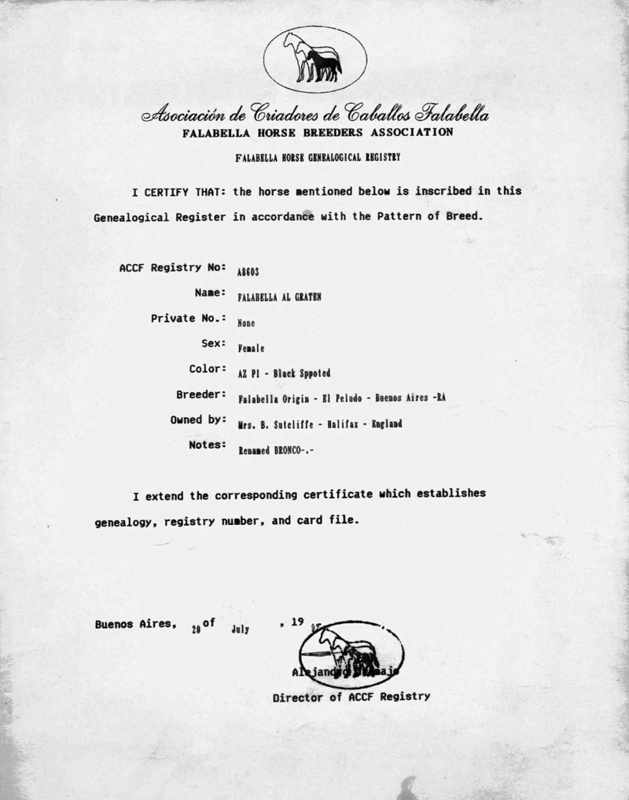 Although DNA testing for horses was in its infancy, blood-typing was sometimes used in order to verify that horses traced back 100% to Establecimientos Falabella. Maria Luisa de Falabella spoke of a ‘gross exaggeration’ of UK Falabella numbers prior to re-enrollment. 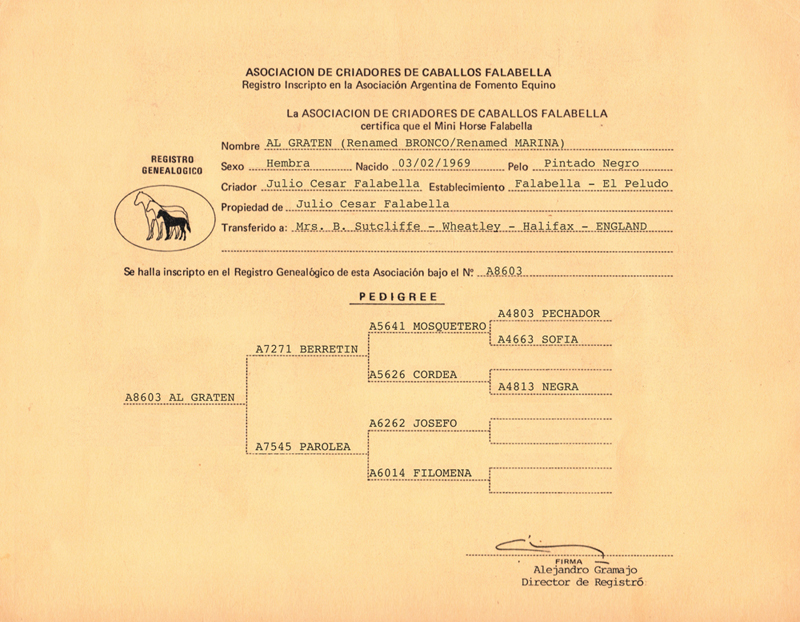 Those that could not be traced back to Establecimientos Falabella 100% were not recognized by the Asociacion de Criadores de Caballos Falabella and therefore not allowed onto their daughter studbooks The Stamboek Europa and the UK Falabella Studbook which are the only authorized European registers for the breed. 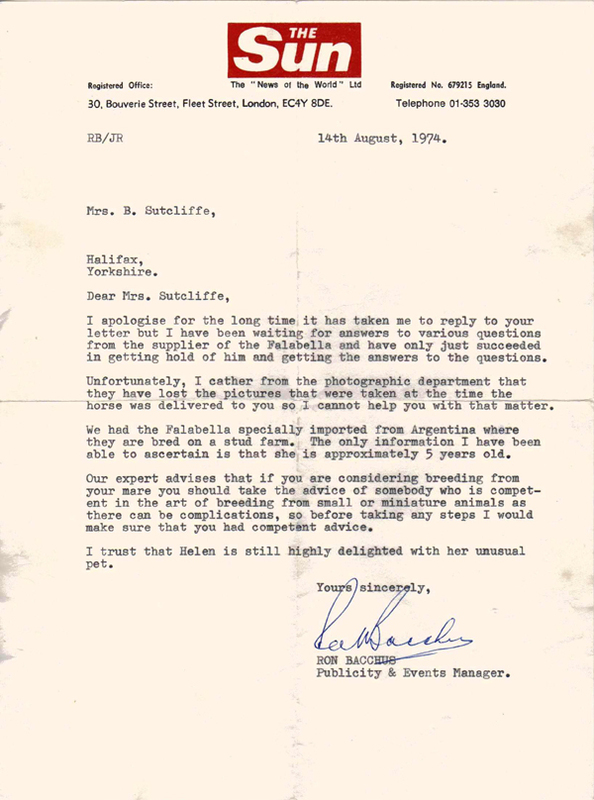 The following is a quote from a letter to Susan Eckholdt from Sra Maria Luisa de Falabella, in December 1997, just prior to Susan's visit to Argentina. 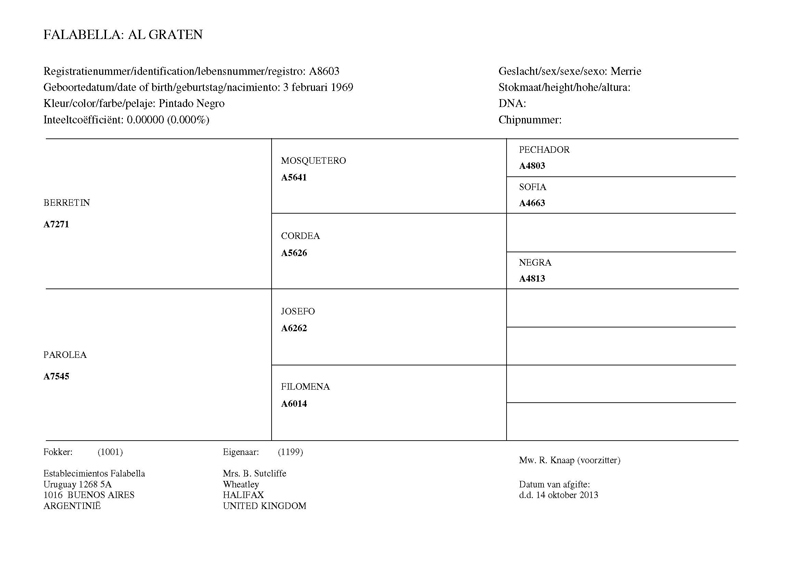 "Regarding the registry, please refer to the following extracted information from ACCF. 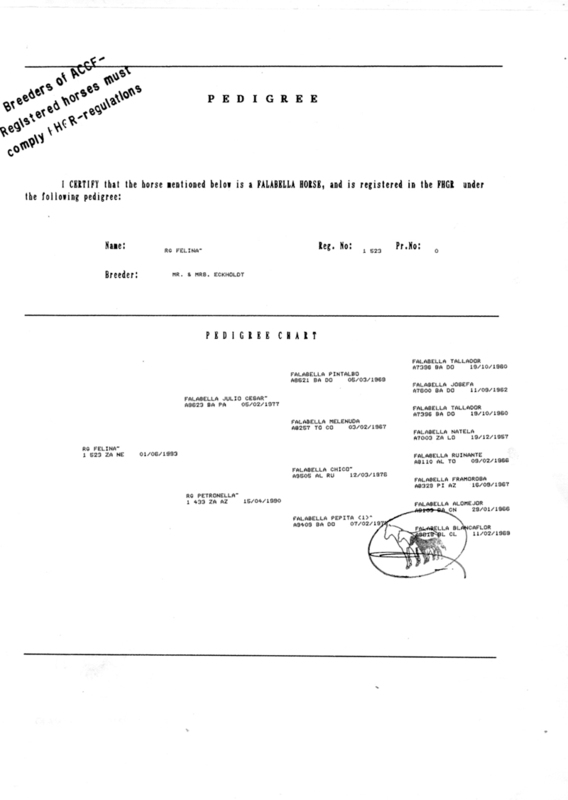 “After 1940, Julio C Falabella started a registry of birth and genealogical details for some of his horses. Due to his remarkable memory and some older data available to him, he was able to obtain – by inference – genealogies up to approximately twenty years back." 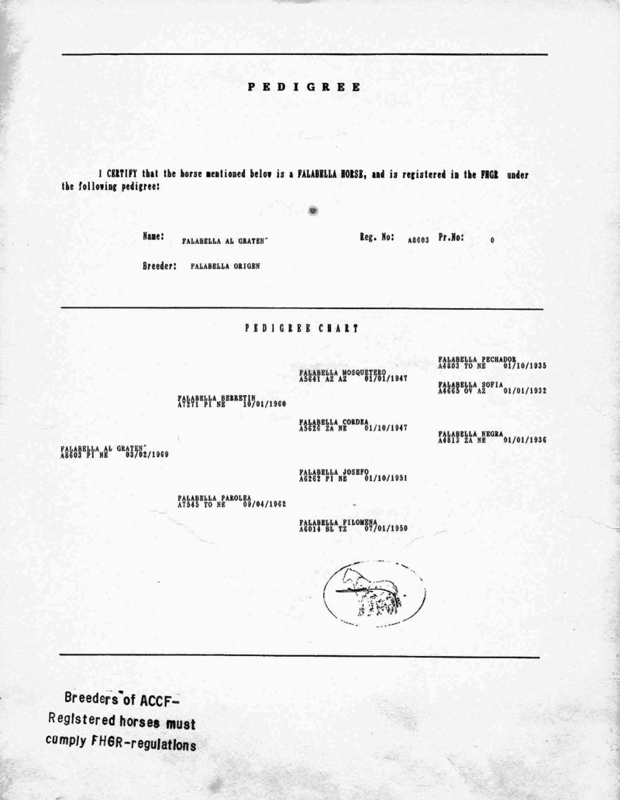 This primary registry – not always methodical – was systemized in the mid-sixties, using classic genealogical techniques. 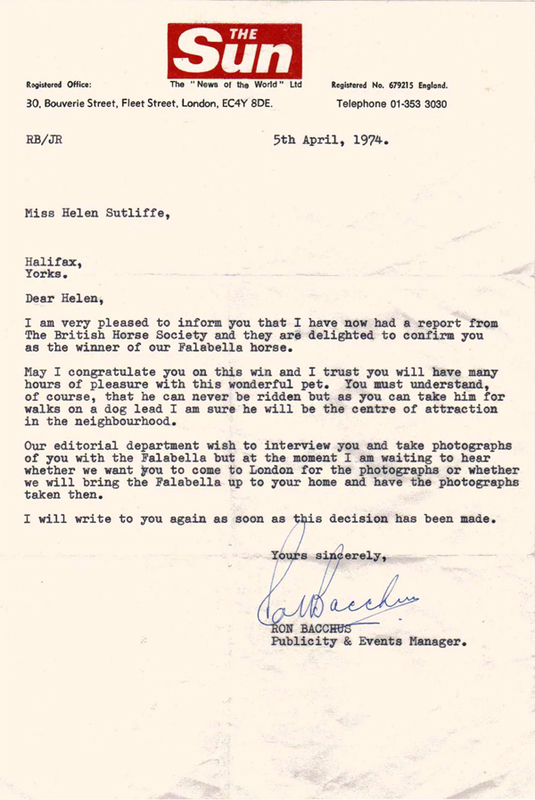 In 1980, whilst honouring the work done by J. C. Falabella for the development of the breed, Establecimientos Falabella decided to redesign the Registry. Speculation regarding the re-enrollment process (by those who were not there at the time) is misguided. 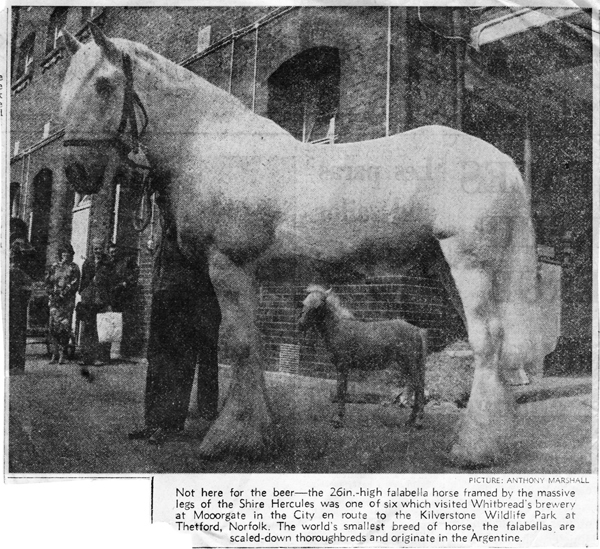 The ACCF made it impossible for any horse of less than 100% Falabella bloodlines to slip through the net. 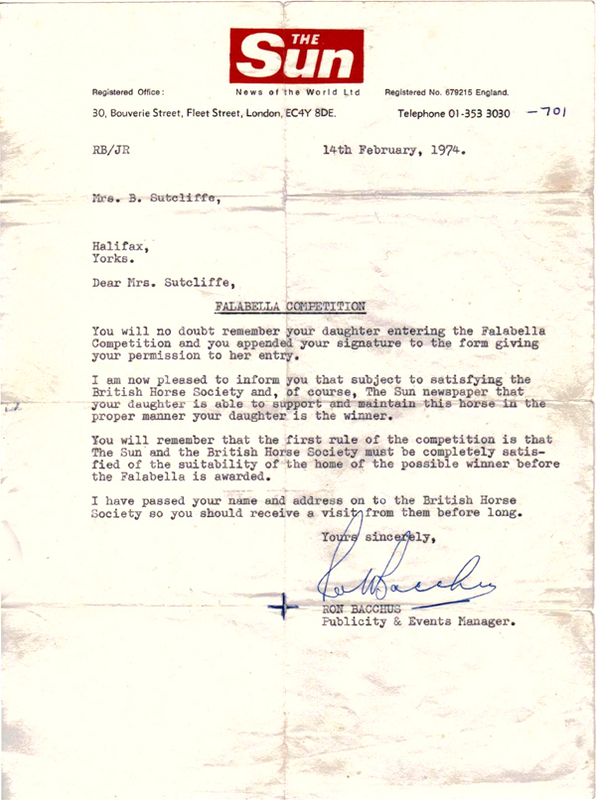 An example of an ACCF 'provisional' certificate of registration issued in 1994. 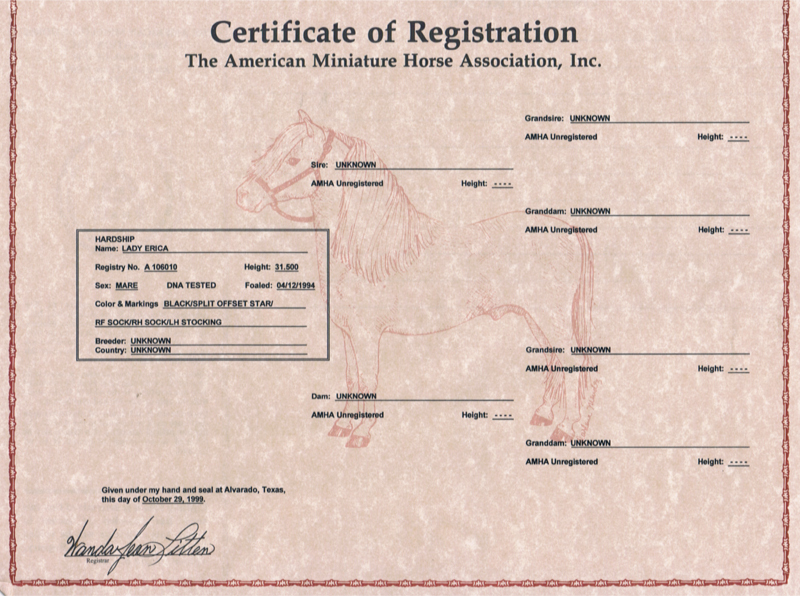 A permanent ACCF certificate of registration (for the same horse) issued in 1996. 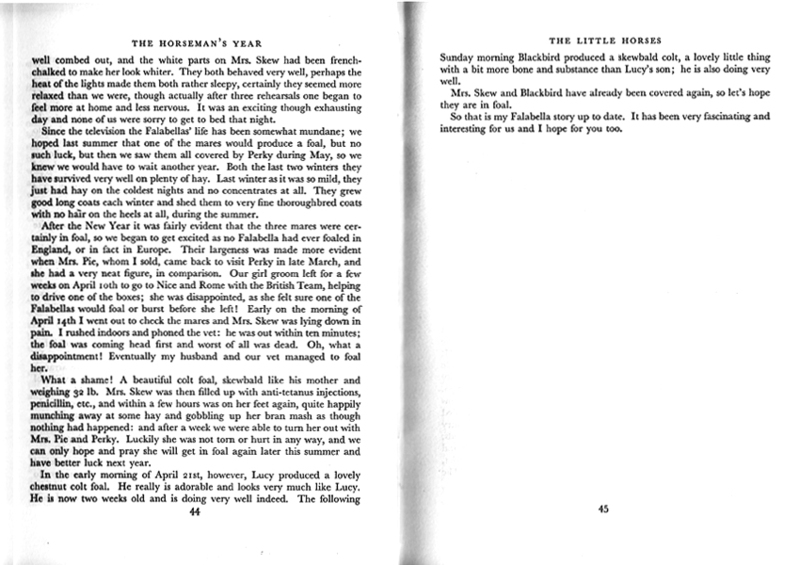 We extend our thanks to Mrs Shirley Marler for this fascinating feature from ‘The Horseman’s Year 1968’, edited by Dorian Williams and published by Collins. 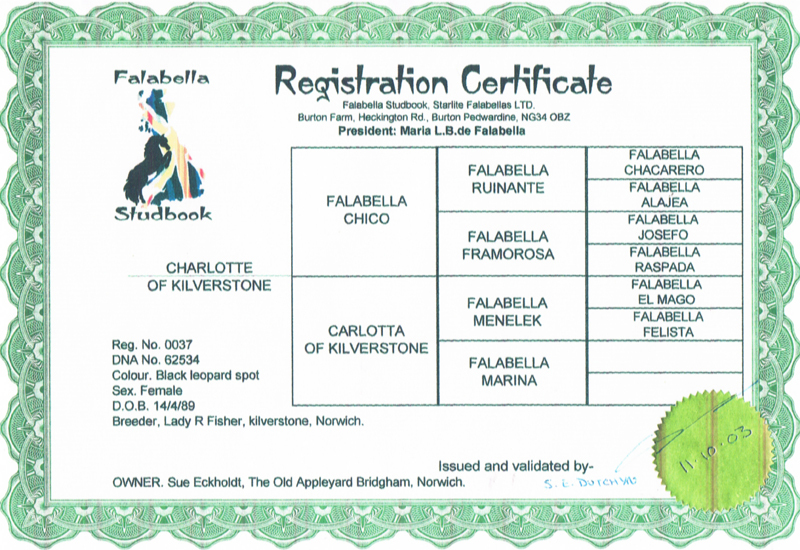 We believe that Shirley’s five imports from Argentina were the first Falabellas in Europe. 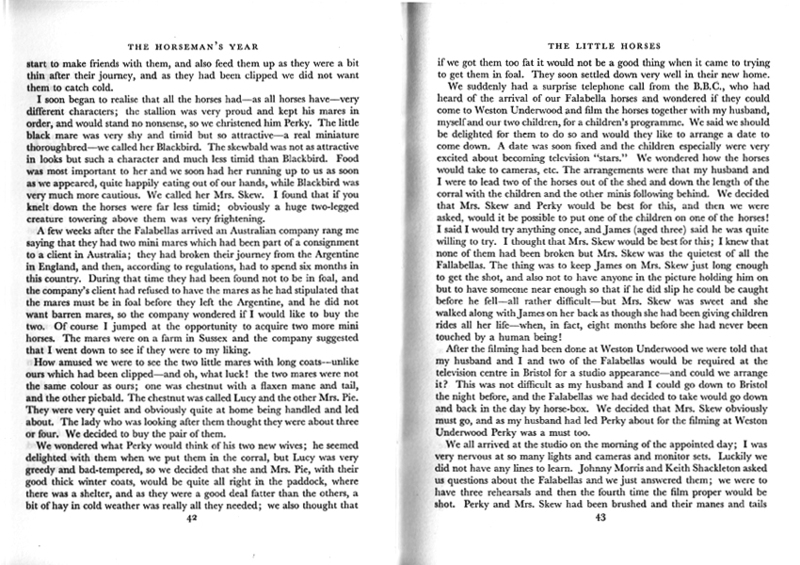 Mrs Shirley Marler with her three first imports from Julio Cesar Falabella on the day of their arrival at her establishment. 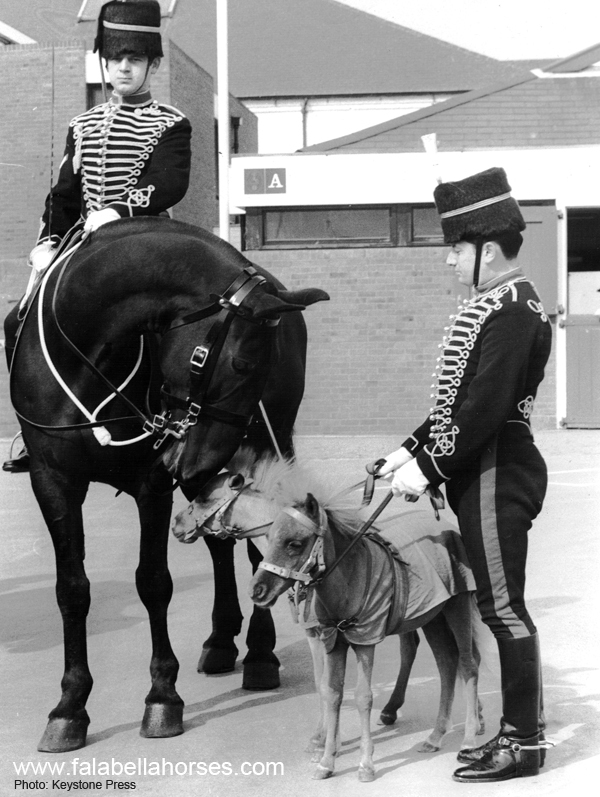 Photographed in 1974 by the Halifax Courier. 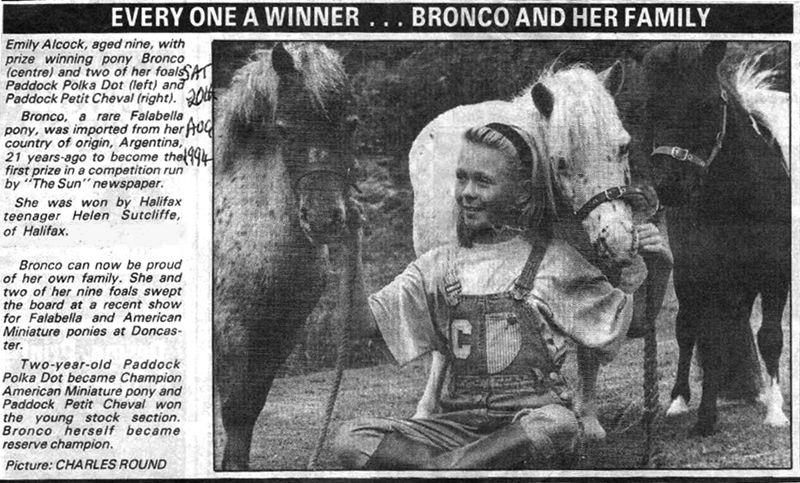 This was actually Bronco's third foal. 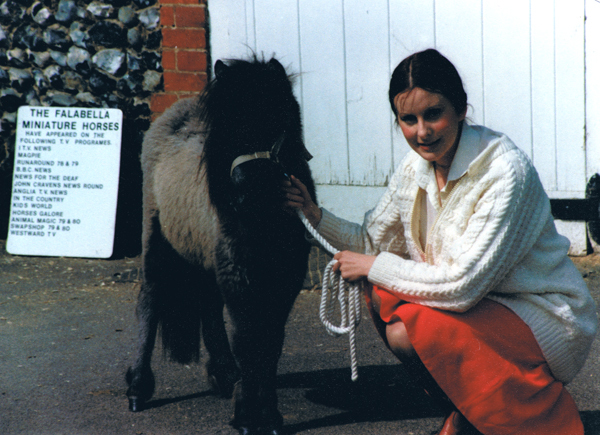 Falabella Marina/ Falabella Al Graten/ Bronco/ Arabella with Mrs. Lillian Holdsworth in 1978.
at Kilverstone in spring 1980.
and Lady Rosamund Fisher. 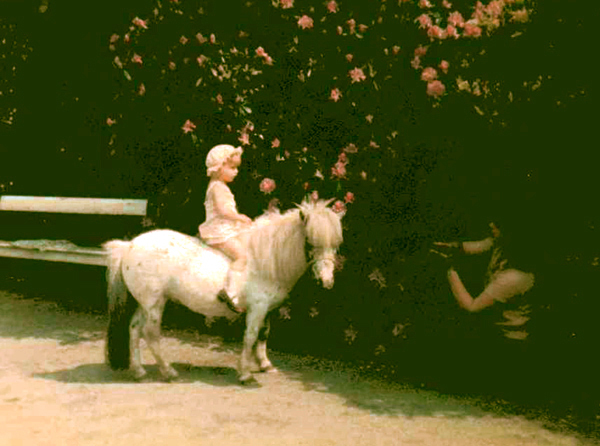 Kilverstone 1981. 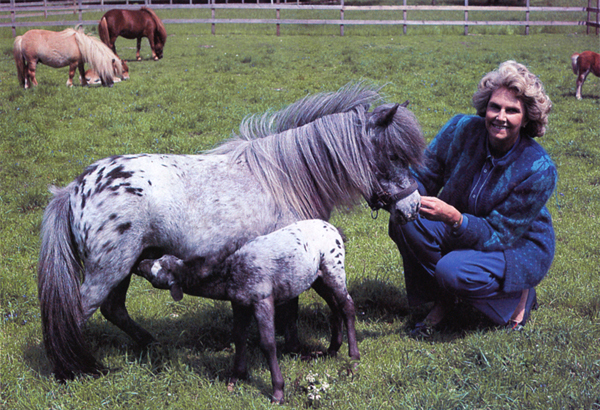 Falabella Marina/ Falabella Al Graten/ Bronco/ Arabella with her second foal, 1981 colt Jamie of Kilverstone at foot. 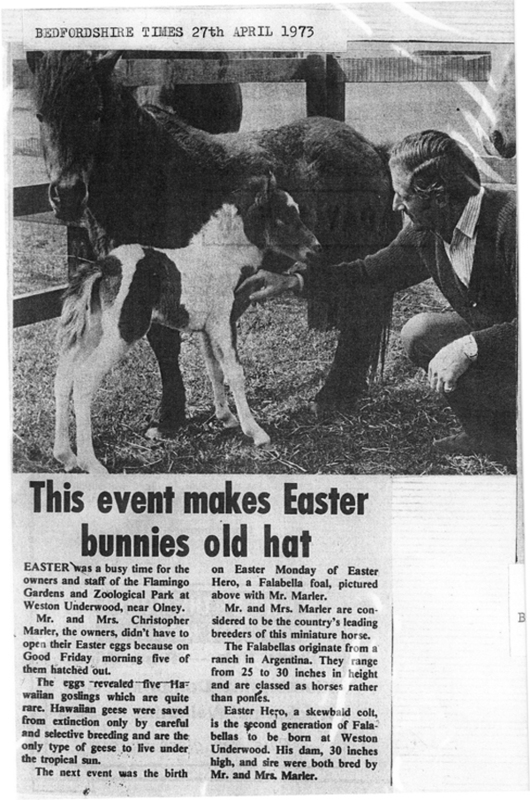 In background Falabella Morenita with filly Marika of Kilverstone. Jamie of Kilverstone (on right) with Lady Fisher. Jamie of Kilverstone with Lady Fisher. 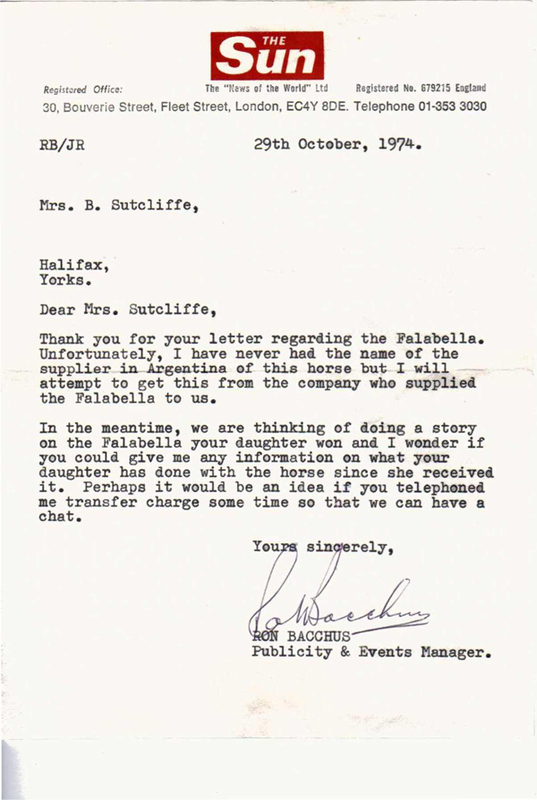 Quote from Mrs Sutcliffe:- 'She was very healthy - I never had to call the vet out to her'. 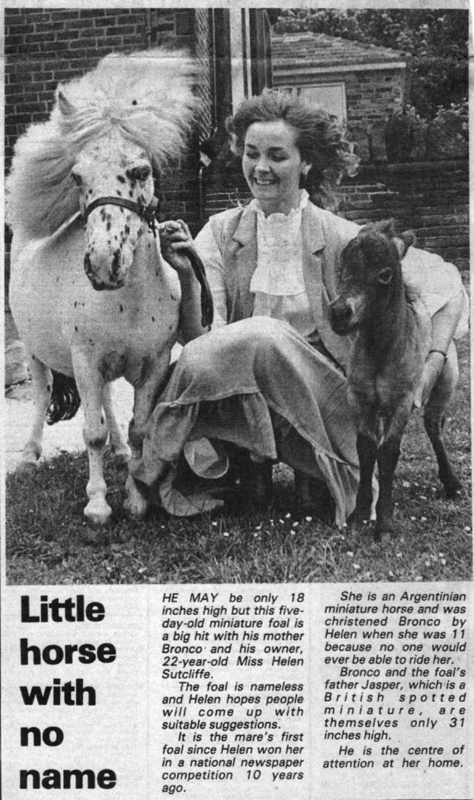 This little Argentine import mare was a prize in 'The Sun' newspaper competition and was won by Helen Sutcliffe, then aged eleven, in 1974. 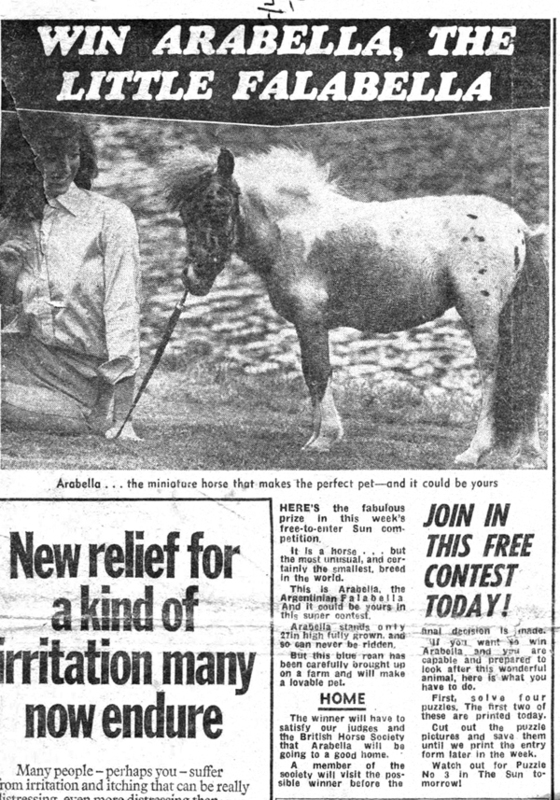 Named Arabella for the 'Sun' competition purposes, then renamed ‘Bronco’ by young Helen Sutcliffe immediately after winning her. 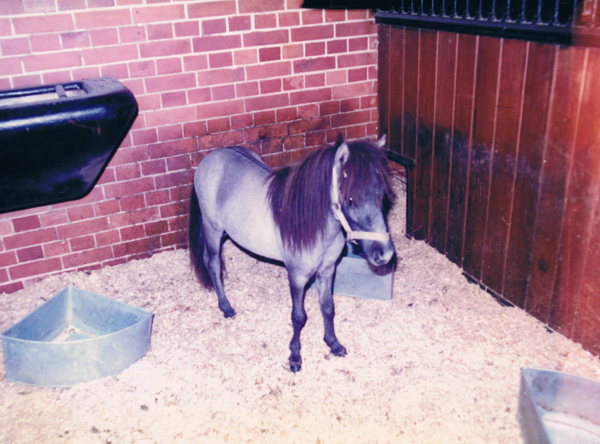 This filly was first registered (with the AMHA) as ‘Marina’ by The Lady Rosamund Fisher whilst on a three year breeding loan to Kilverstone between November 1978 and October 1981. 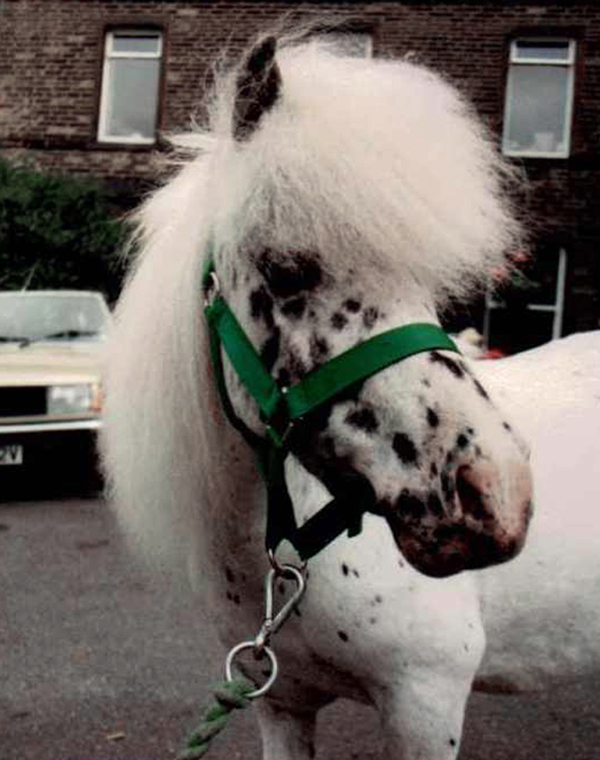 Later, after returning to Yorkshire, she was AMHA registered as ‘Bronco’ in 1990. 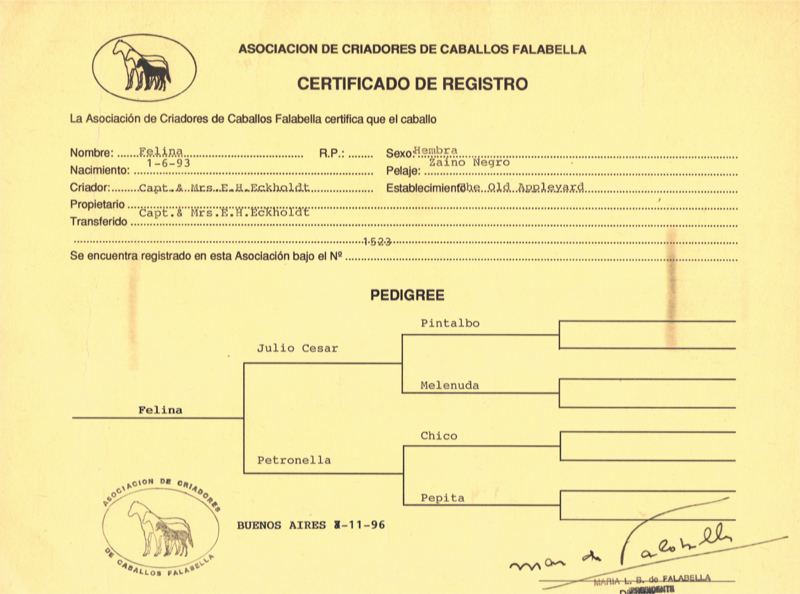 Then, during the re-enrollment required by the mother studbook the Asociacion de Criadores de Caballos Falabella (which began in 1991) the original name of this horse was finally discovered - 'Falabella Al Graten' meaning 'Falabella to the bone'. 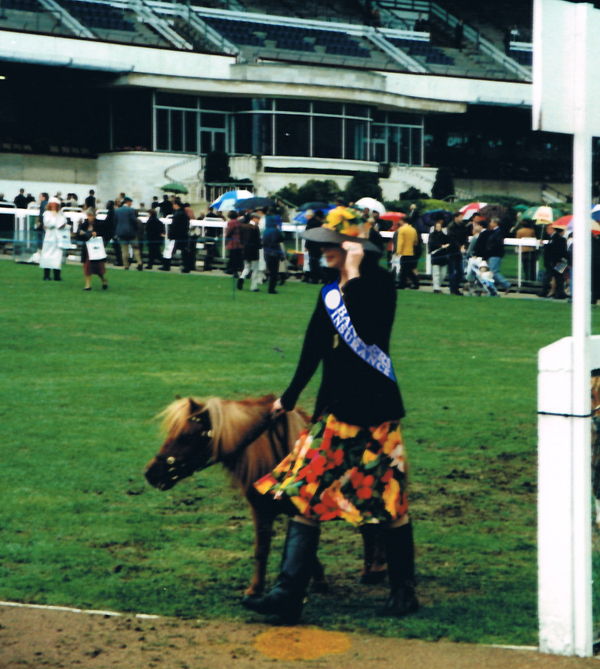 This striking little mare excelled in the show-ring for many years, creating a stir whenever she appeared in public. She died in 1997. 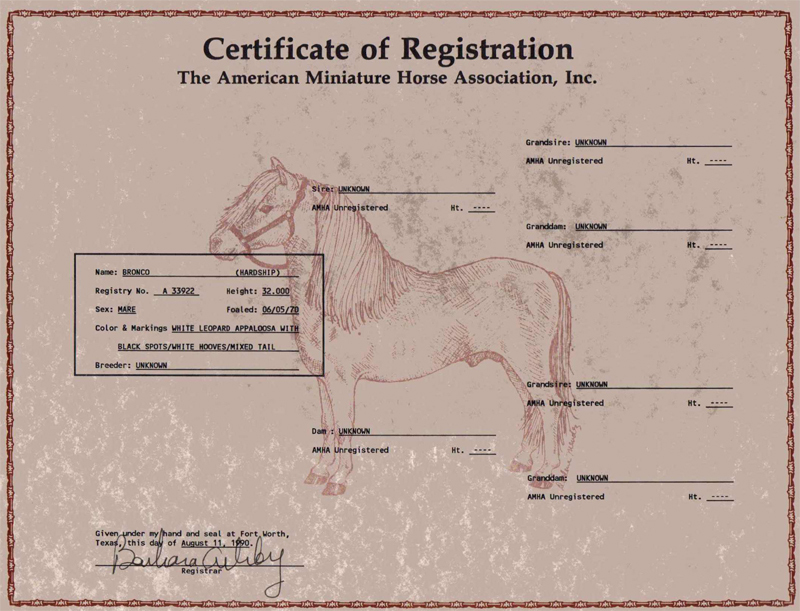 It was not unusual for people to register their miniature horses with the AMHA during the 1970's and 1980's - there were few alternatives in those days. 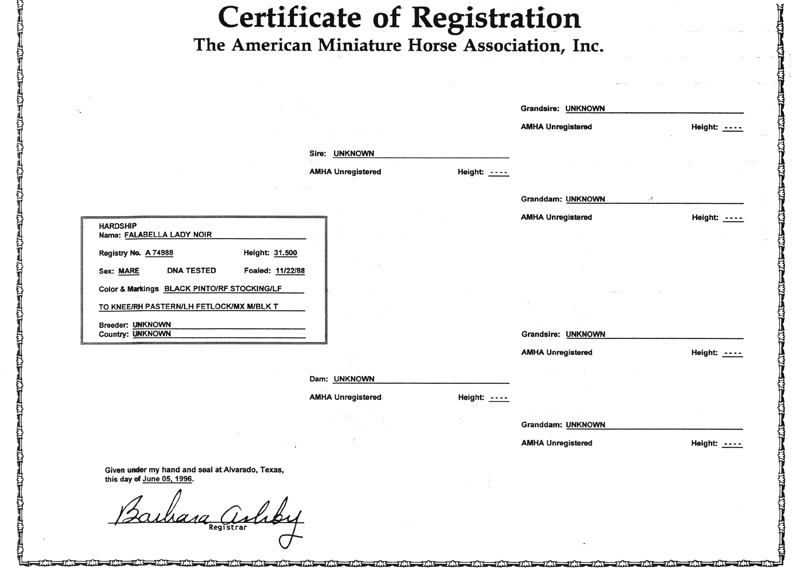 Any miniature horse (of any bloodline) which would mature below 34 inches could be registered with the AMHA. 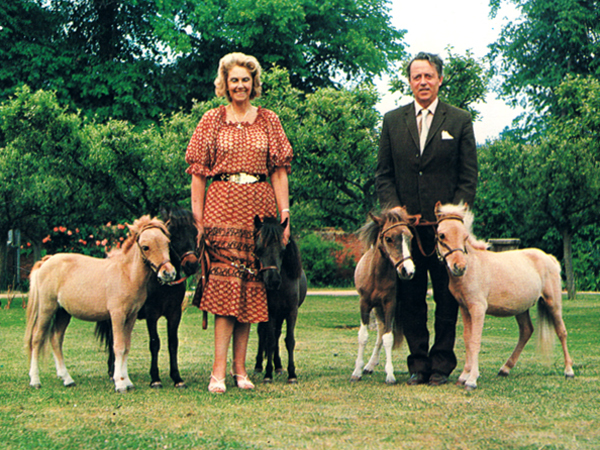 Lord and Lady Fisher sold their Falabella horses worldwide for more than twenty seven years although most were sold to the USA. 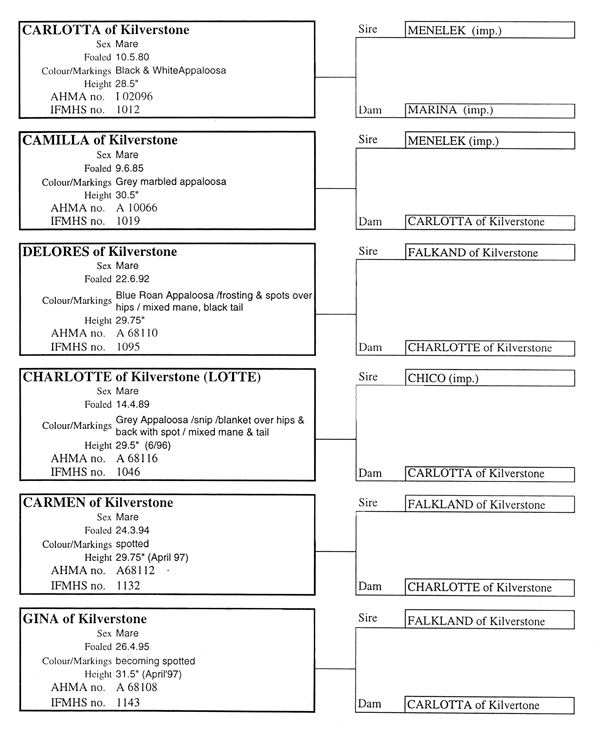 They registered the majority of their 'Kilverstone' horses with the AMHA for the American market, sometimes utilizing non-Falabella lines, so that not every Kilverstone horse was 100% Falabella. 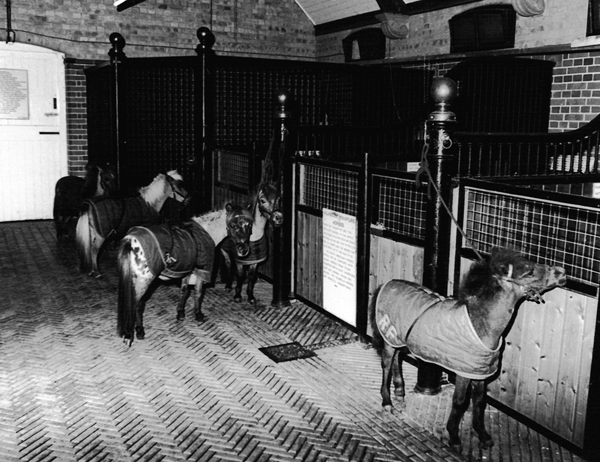 These horses were also registered with The International Falabella Miniature Horse Society (IFMHS) which was formed solely for the Kilverstone bred horses and their progeny. 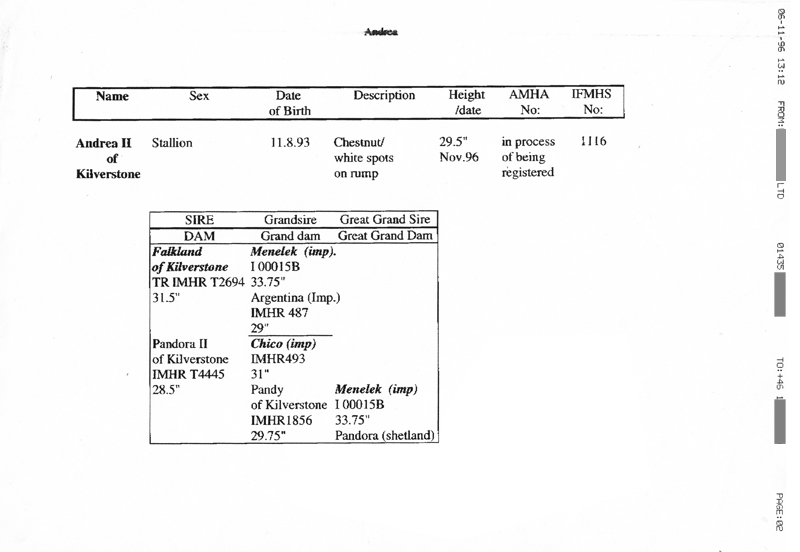 Many of the horses on this register were not pure bred Falabellas. 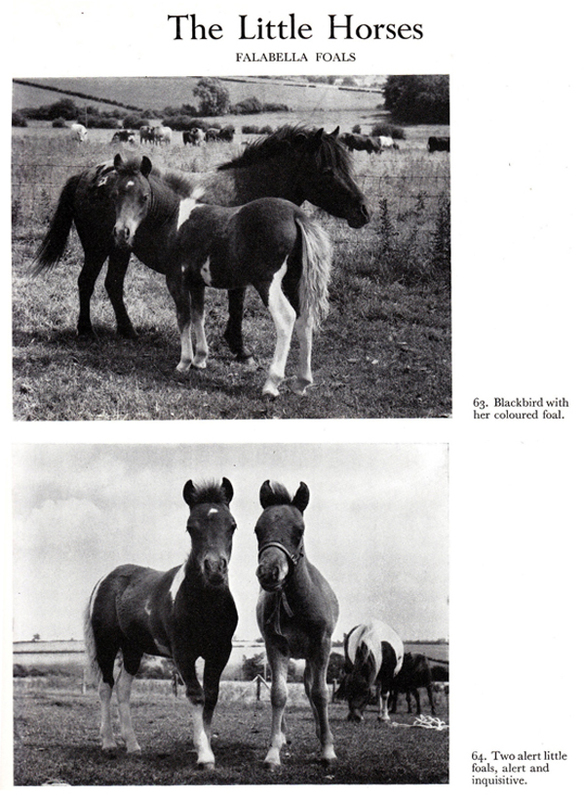 showing the addition of Shetland blood which prevents these two horses from being Falabellas. 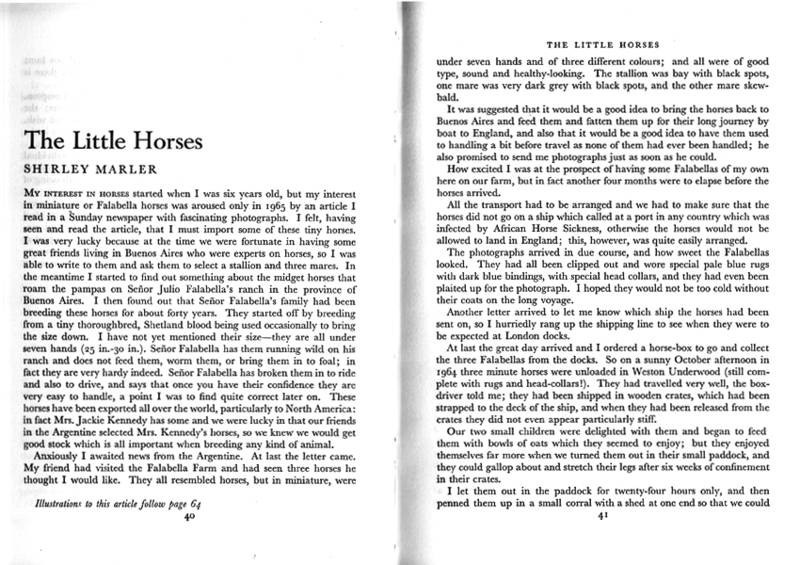 The Mother Studbook - The Asociacion de Criadores de Caballos Falabella stipulates that a Falabella must be traceable back to Establecimientos Falabella 100%, so many of the Kilverstone horses were not accepted by the mother studbook after re-enrollment in the 1990's. 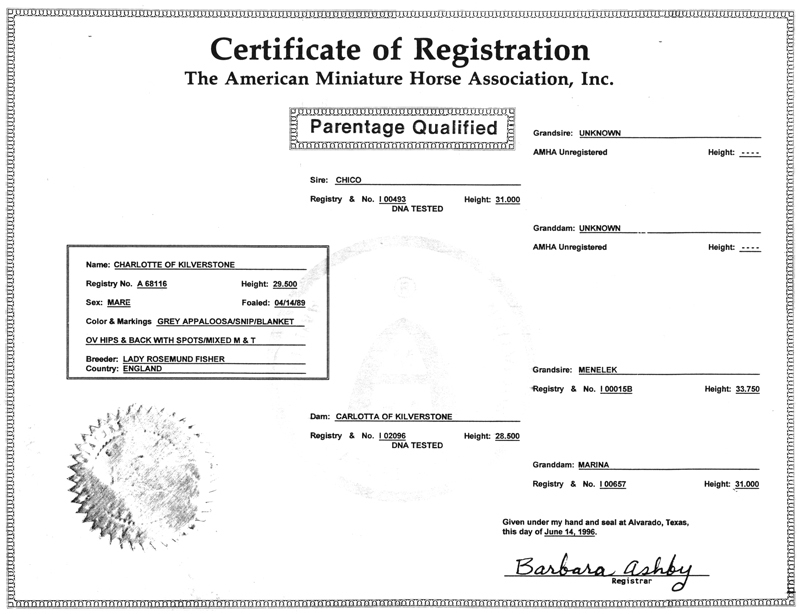 During re-enrollment, Falabella Al Graten was inadvertently re-inscribed under her two different AMHA names ('Bronco' and 'Marina') by two different people in different years, registering her foals. 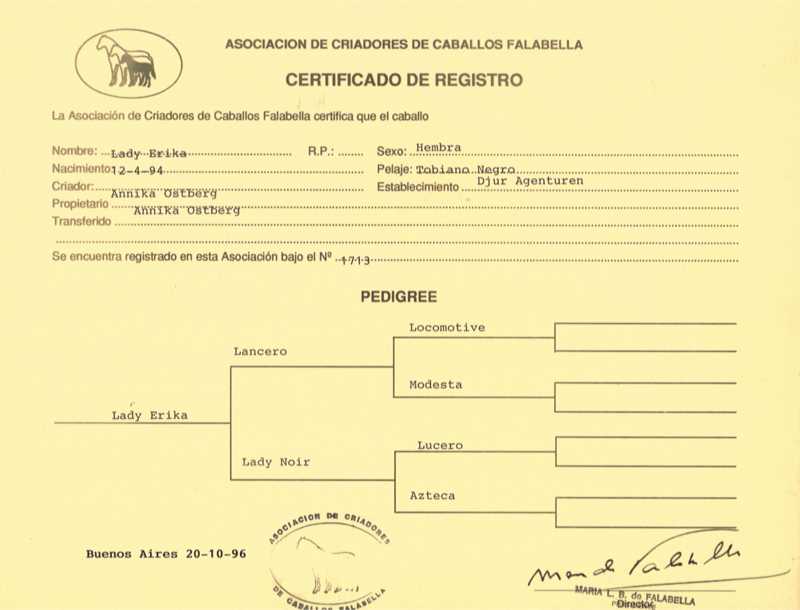 This means that she (currently) appears as ‘Falabella Marina’ on the European Studbook pedigree of Carlotta of Kilverstone (and her progeny) but as ‘Falabella Al Graten’ on the Asociacion de Criadores de Caballos Falabella pedigree of Paddock’s Petite Cheval and her filly. 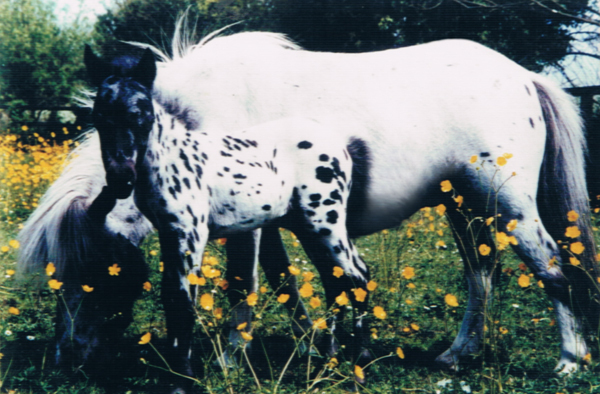 She had six other non-Falabella foals with British Spotted Pony and American stallions and appears as ‘Bronco’ on those pedigrees. 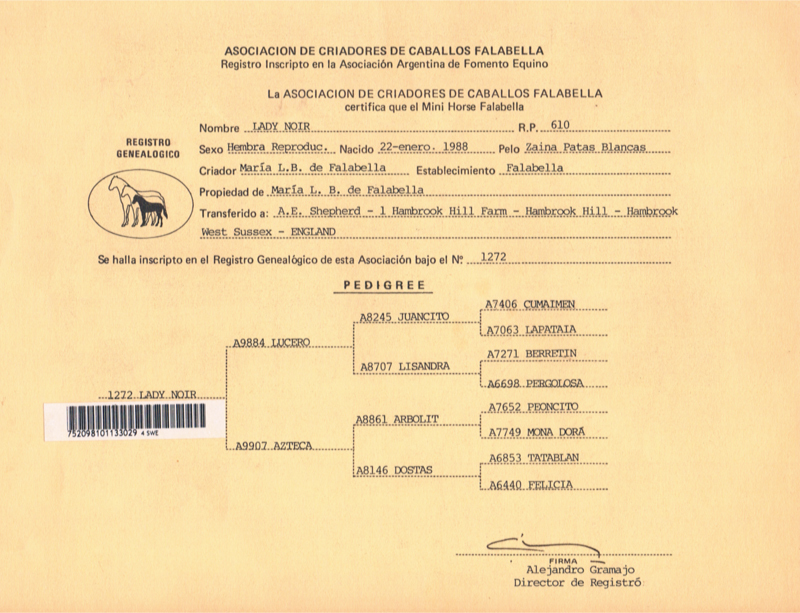 Falabella Marina/ Falabella Al Graten/ Bronco pedigree back to 1932.
along with the Argentine imports of Lady Fisher's: Chico, Julio, Menelek, Pepita and Morenita. 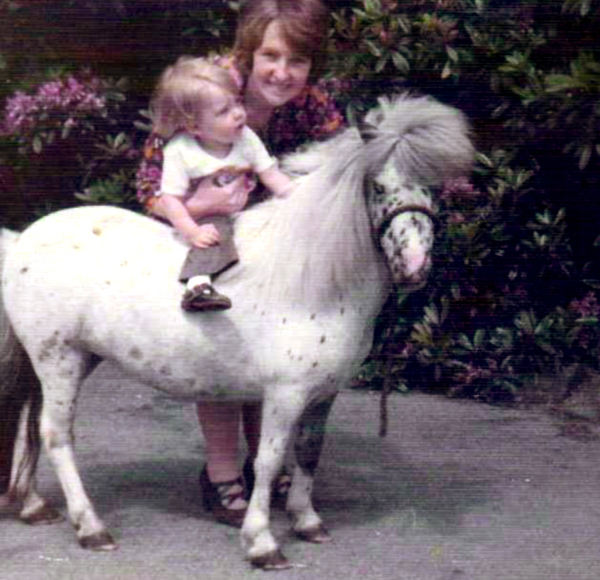 which resulted in the foals Carlotta of Kilverstone in 1980 and Jamie of Kilverstone in 1981. 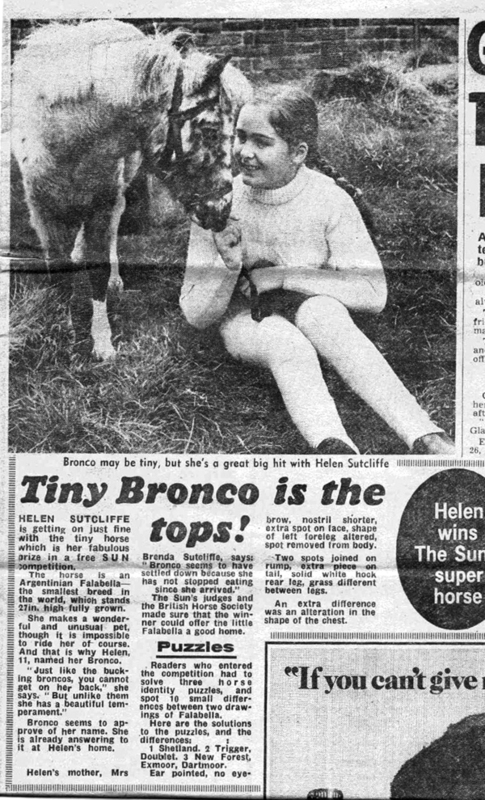 As Bronco's date of birth was unknown at the time of her registration with the AMHA (prior to the re-enrollment required by the ACCF in the mid-nineites) Mrs Sutcliffe decided to give her the same birthday as her daughter Helen. - 5th June. 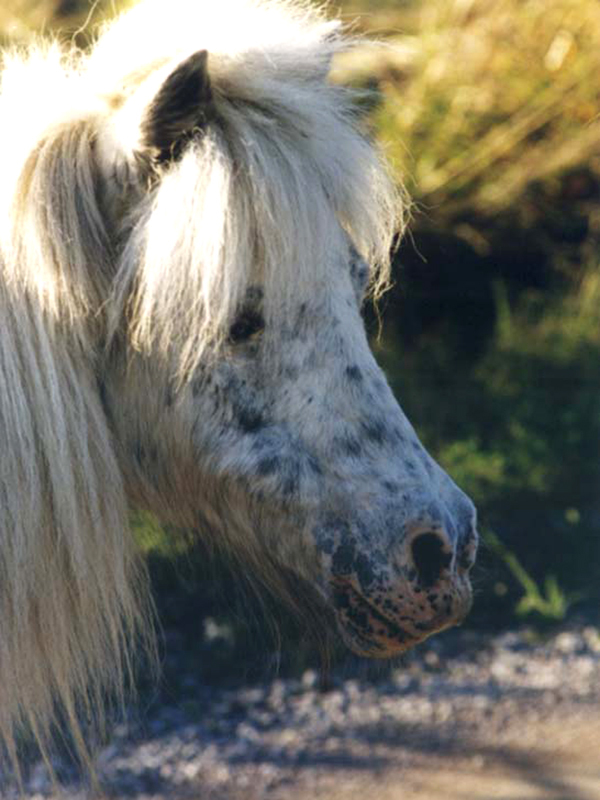 Lady Fisher's estimate of the date of birth for the same horse 'Falabella Marina' was based on veterinary tooth examination. 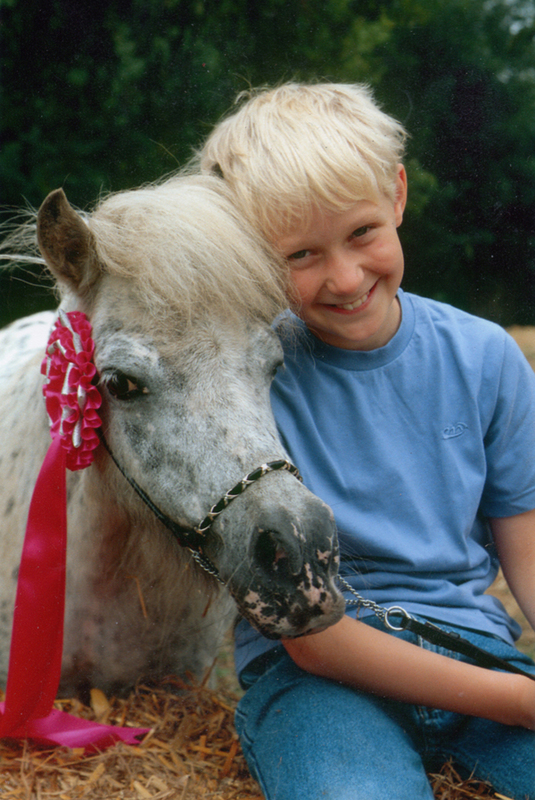 This blue eyed pintaloosa mare is in many of our 'Equuleus' bloodlines through her daughter Carlotta of Kilverstone foaled in 1980. 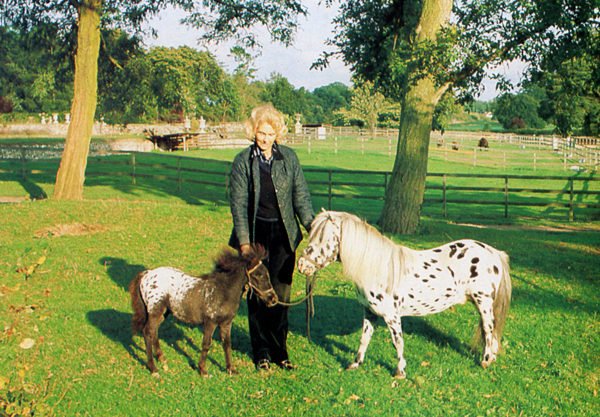 She had two other purebred foals, a black pintaloosa colt named 'Jamie of Kilverstone' in 1981 and a black pinto filly 'Paddock's Petite Cheval' (by Gaterley Rupertino) foaled 22nd May 1993 in Yorkshire. 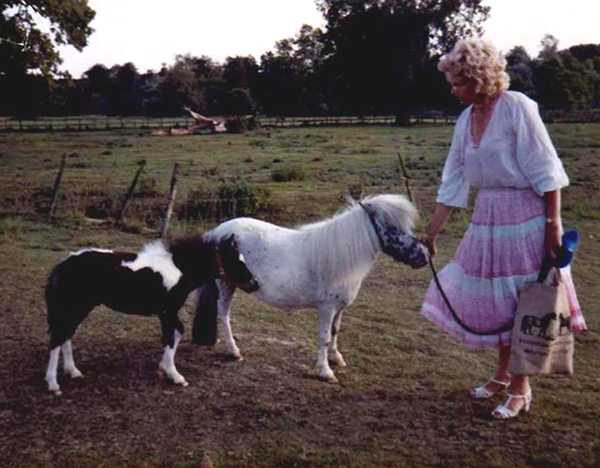 Mrs Brenda Sutcliffe would be interested in seeing your images of Bronco/Al Graten/Marina/Arabella if you photographed her at The All Miniature Breeds Show in Doncaster, 1994 or during the time she was at Kilverstone Wildlife Park in Norfolk – autumn 1978 – autumn 1981. 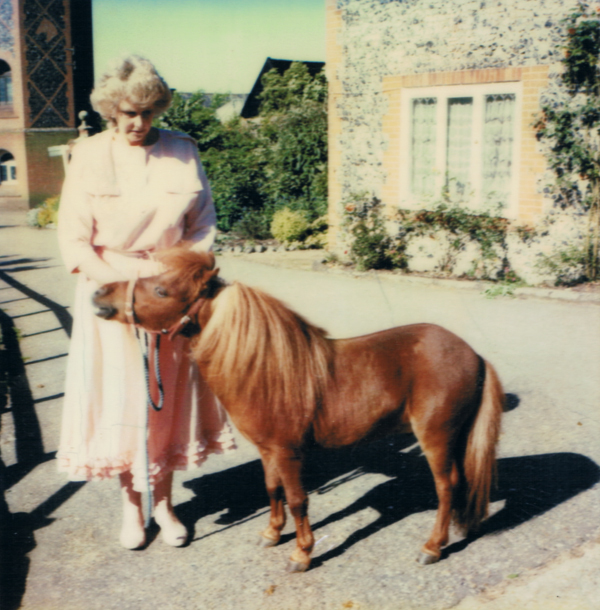 (by Falabella Menelek) the world famous Pegasus of Kilverstone with Lady Rosamund Fisher, 1984. 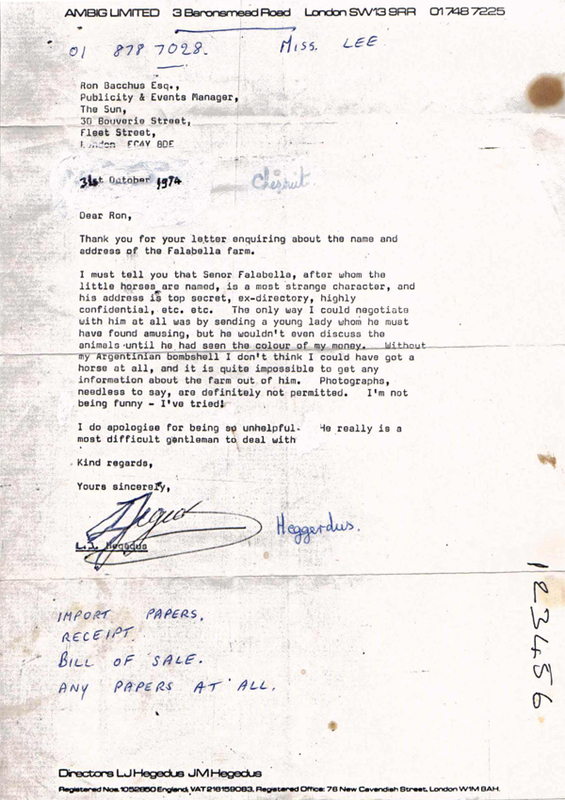 'I never sell Carlotta or her daughters foals if they are fillies'. 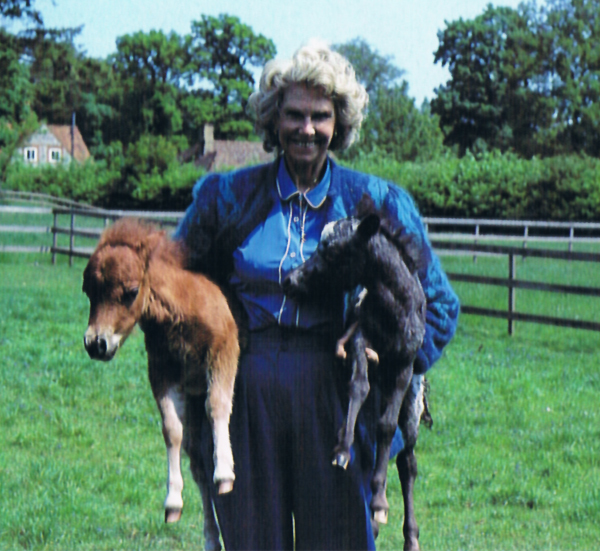 The world famous Pegasus of Kilverstone, Carlotta of Kilverstone's first foal (right) by Falabella Menelek, with Lady Rosamund Fisher, 1984. 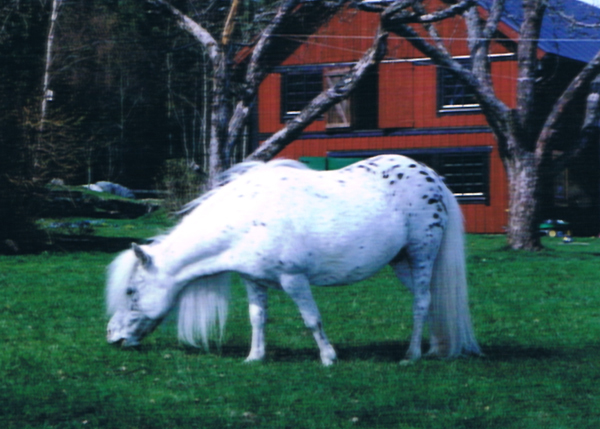 "We consider Pegasus (featured with a full page spread in the reference book ‘The Ultimate Horse’) the most beautiful miniature Appaloosa stallion anywhere in the world. 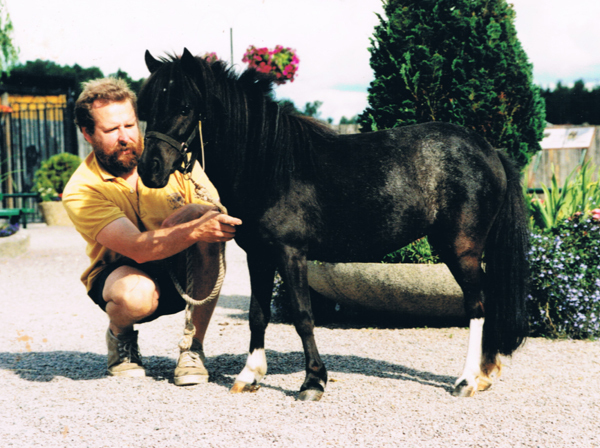 He is the son of Menelek (imported 1978) who was Senor Julio Cesar Falabella’s prize stallion and King of his herd." photo: Limelight's Animals, Sweden 1998. 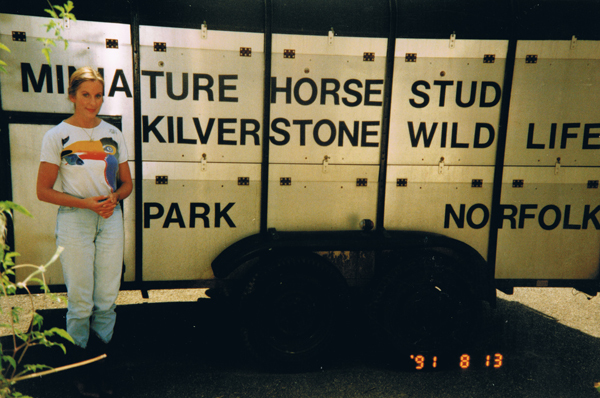 Carlotta of Kilverstone at Kilverstone 1991. 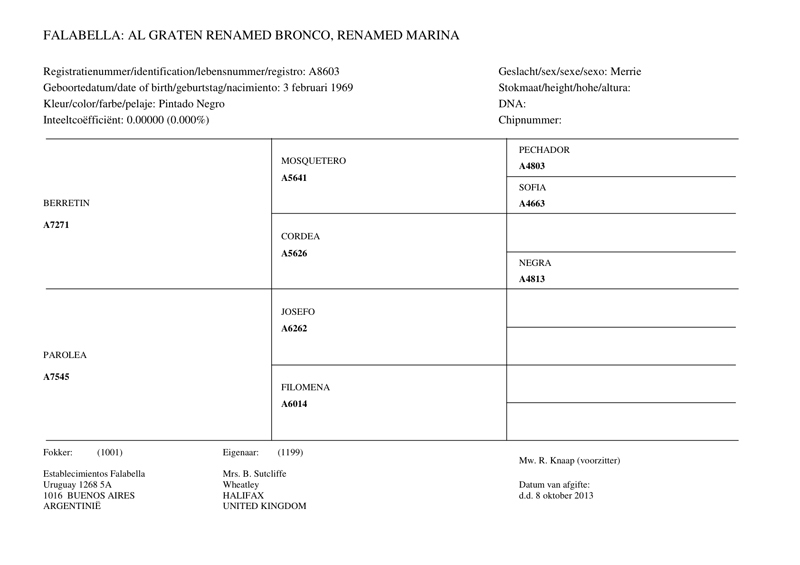 Falabella Marina/Falabella Al Graten (Bronco) bloodline mares and fillies which had never been offered for sale. 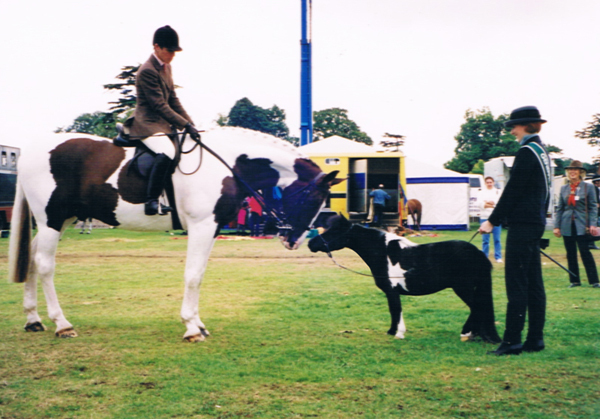 Charlotte of Kilverstone (daughter of Carlotta by Falabella Chico) with Robin Fisher of Kilverstone c. 2006. 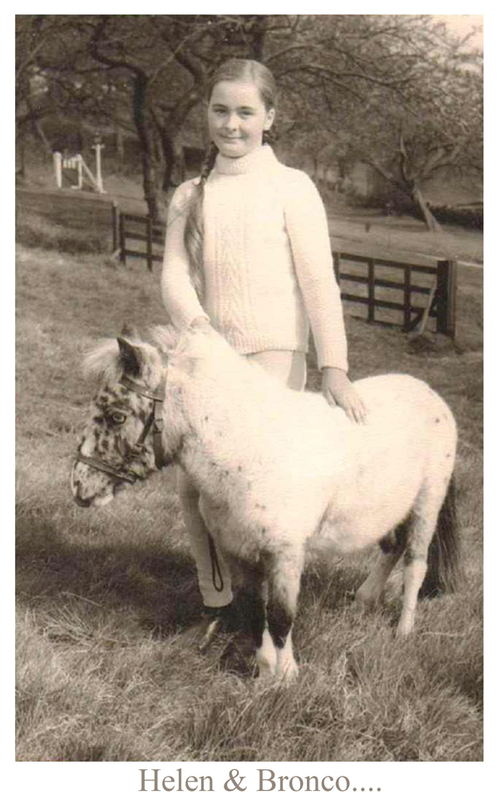 Equuleus Jessica (daughter of Charlotte of Kilverstone) shows the unmistakable 'Arabian' stamp of Falabella Al Graten. Carlotta of Kilverstone with her daughter Charlotte of Kilverstone in Sweden. and Dalmatian II of Kilverstone (blend) in Sweden. 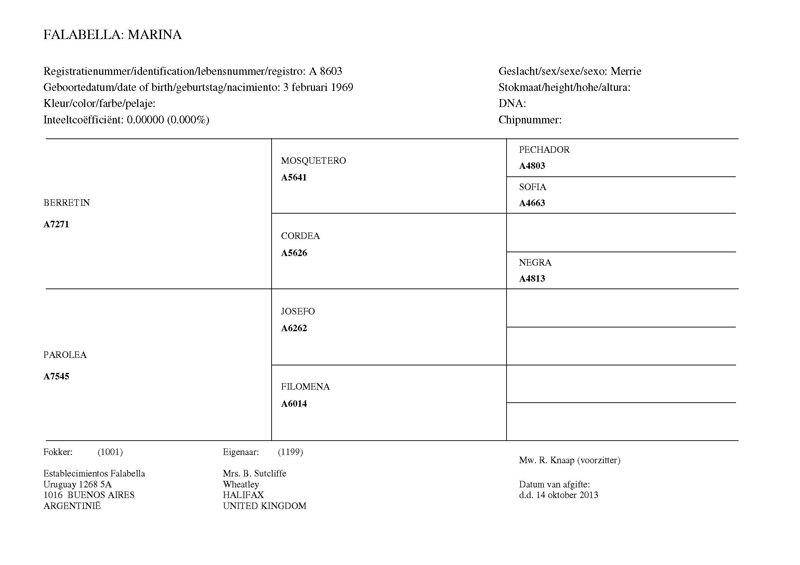 Carlotta and all her progeny were DNA tested (for AMHA registration) in the early nineties. 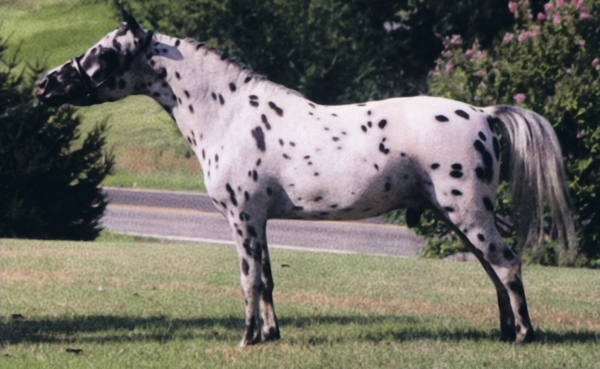 Don Ricardo of Kilverstone by Dalmation II of Kilverstone (87.5% Falabella blend) ex Carlotta of Kilverstone. 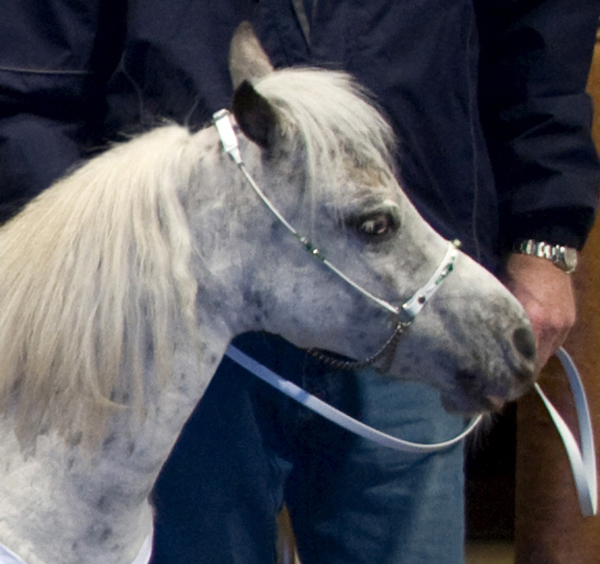 An American Miniature Horse (high percentage Falabella) exported to the USA. 'I'm afraid we have nothing in Carlotta's line for sale this year, her colt has been sold to someone in America'. 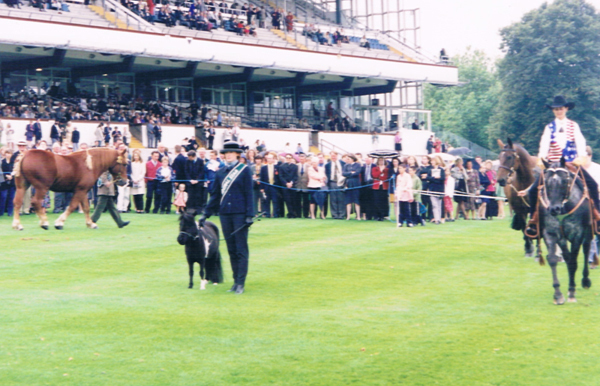 at The Ascot Festival of British Racing 1999. 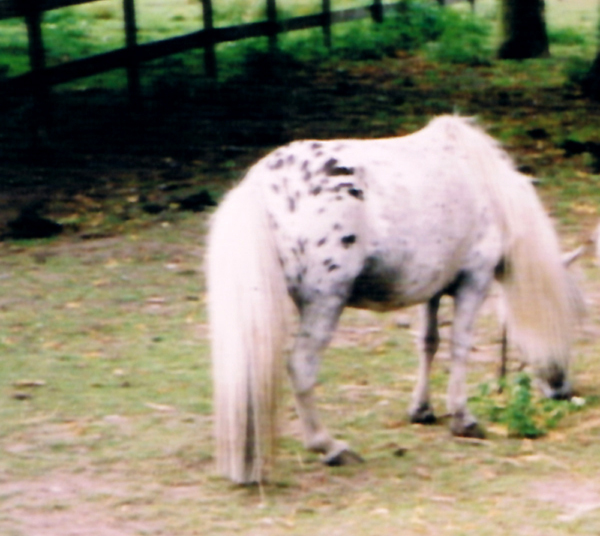 Petite Cheval was DNA tested (for ACCF registration) in 1998. Limelight's Magnolia with filly Limelight's Amazing Grace by Falabella Yabito. Magnolia (by Pegasus of Kilverstone) is a great grand-daughter of Falabella Al Graten/Bronco/Marina. Limelight's Amazing Grace (by Falabella Yabito ex Limelight's Magnolia) and filly. Grace is a great, great grand-daughter of Falabella Al Graten/Bronco/Marina. 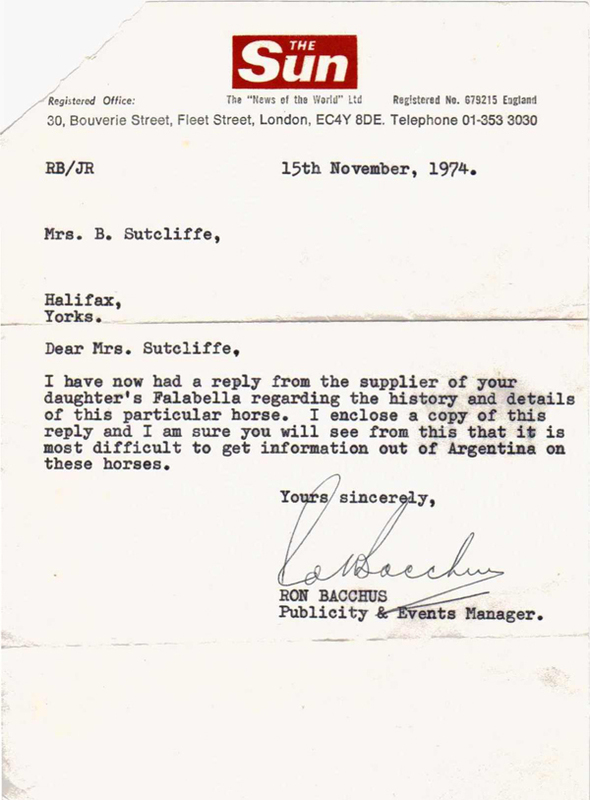 Many of our Equuleus prefix horses trace back to this most famous Argentine import. 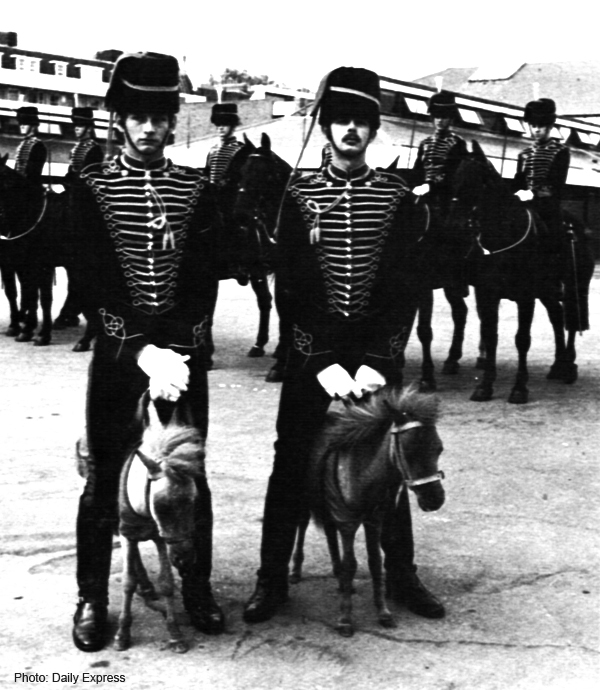 Royal Horse Artillery at St. John's Wood Barracks in September 1977. 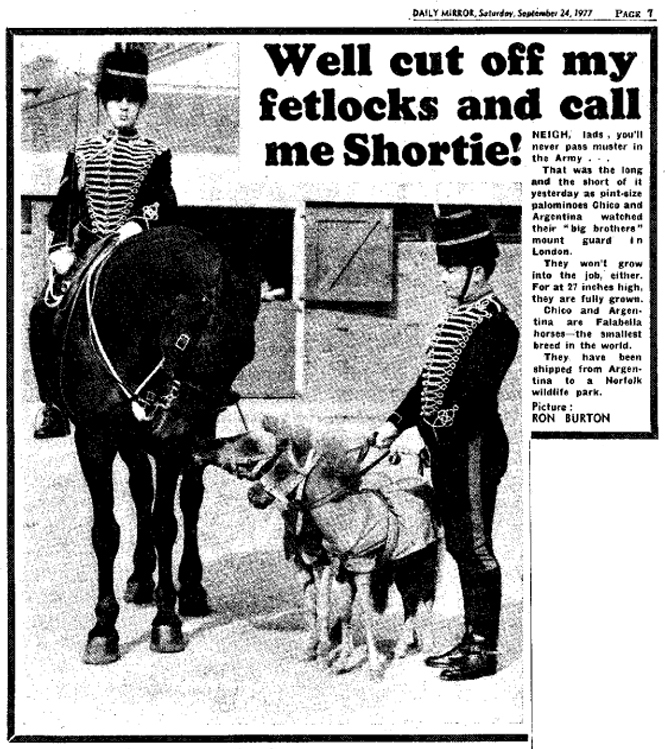 Daily Mirror feature 24th September 1977 - these horses were assumed to be fully grown but were in fact foals - see below. 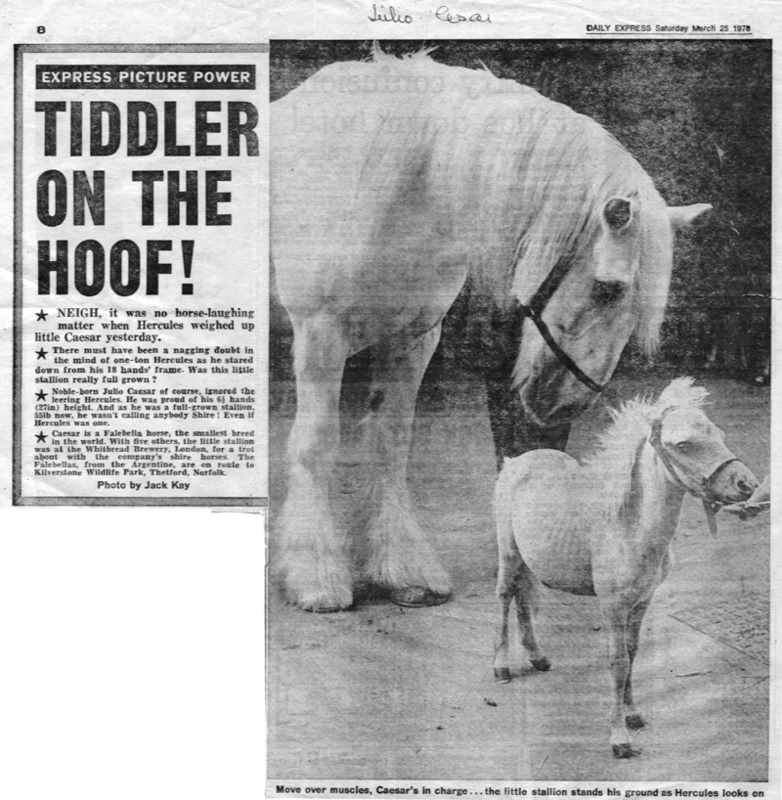 Daily Express feature 25th March 1978 - this horse was assumed to be fully grown but was in fact a foal - adult photo below. 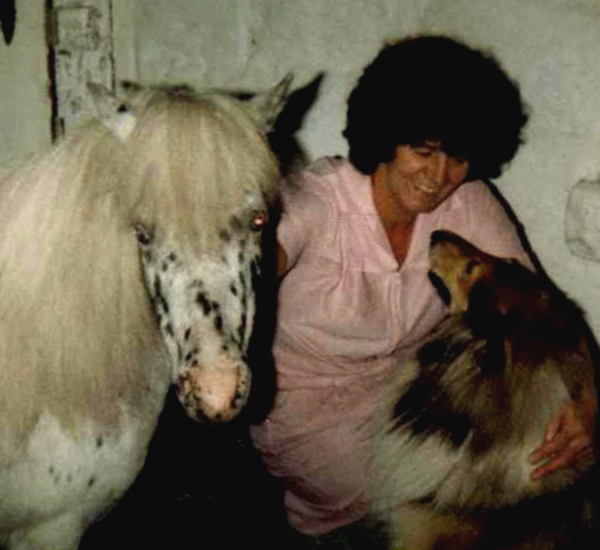 Susan Eckholdt with two horses at Kilverstone - one in it's winter coat and the other clipped (c. 1980). 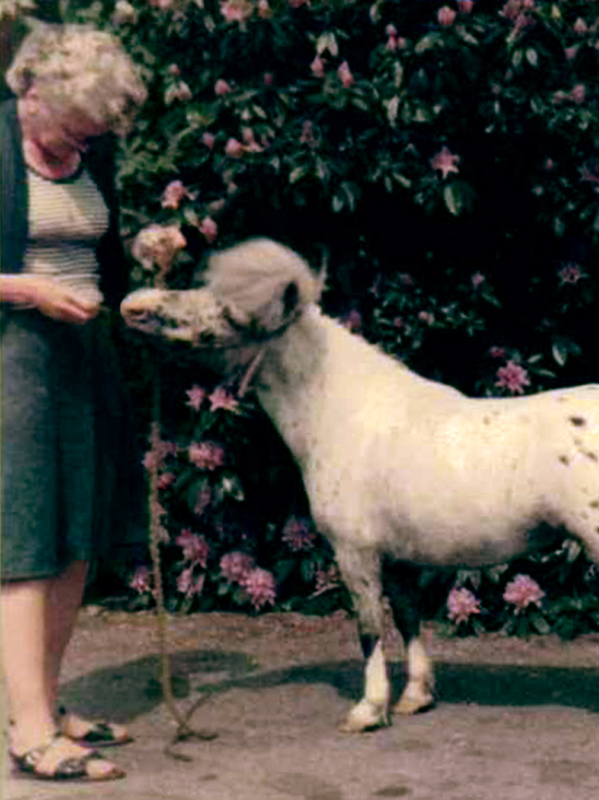 Sue with a horse in it's winter coat at Kilverstone (c. 1980). 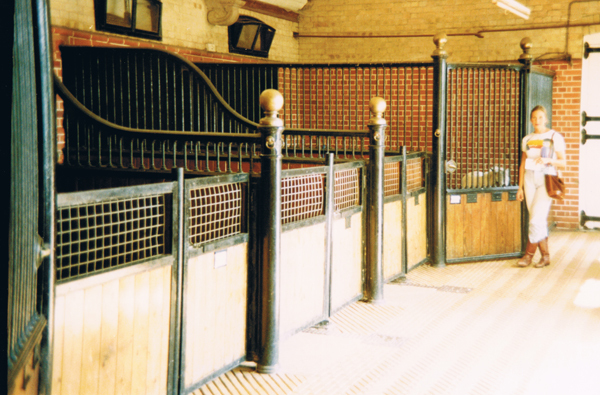 The same horse as above, now clipped in 'The Old Stables' at Kilverstone (c. 1980). 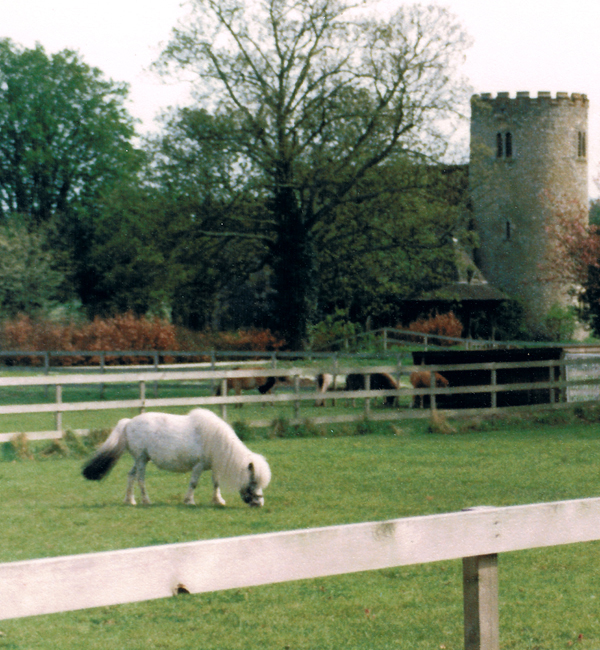 Sue in the grounds of Kilverstone Hall (c. 1980). 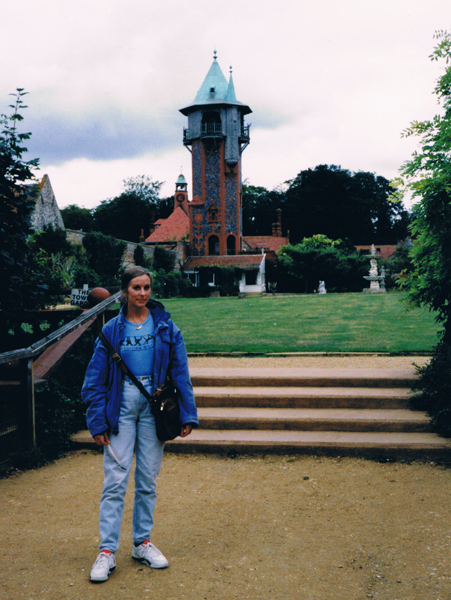 Sue in the 'Old Stables' at Kilverstone, formerly the stables for the carriage horses (1991). 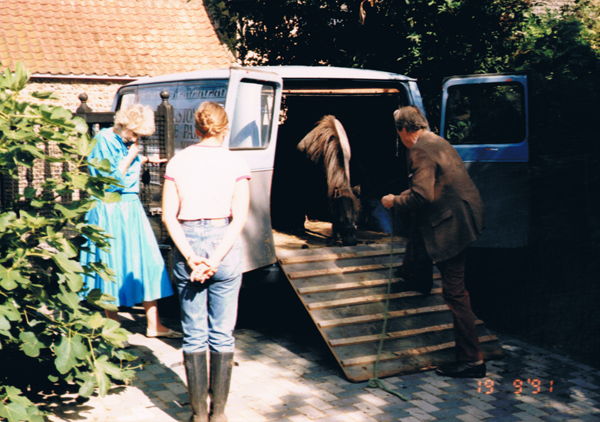 Sue waits for some of her purchases to be loaded onto the Zoo's trailer (1991). 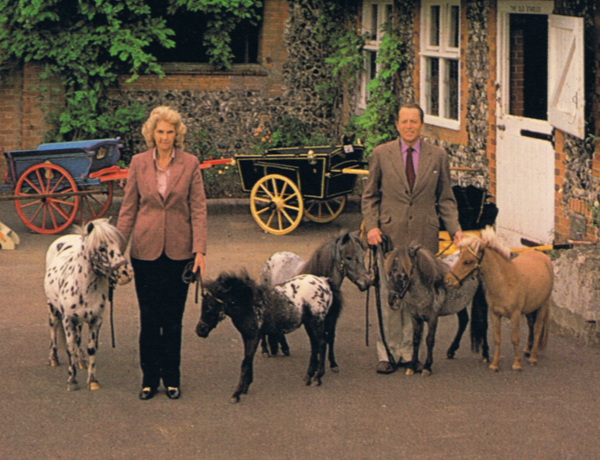 The Lord John and Lady Rosamund Fisher of Kilverstone deliver some of Sue and Ed's Falabellas (1991). 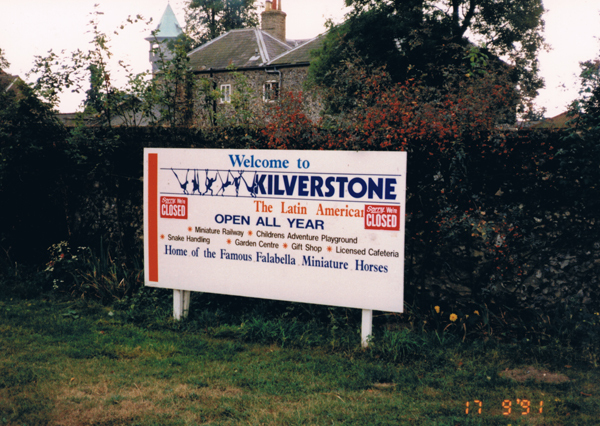 The very sad closure of the Kilverstone Latin American Zoo, which in the past, brought so much pleasure to so many people. 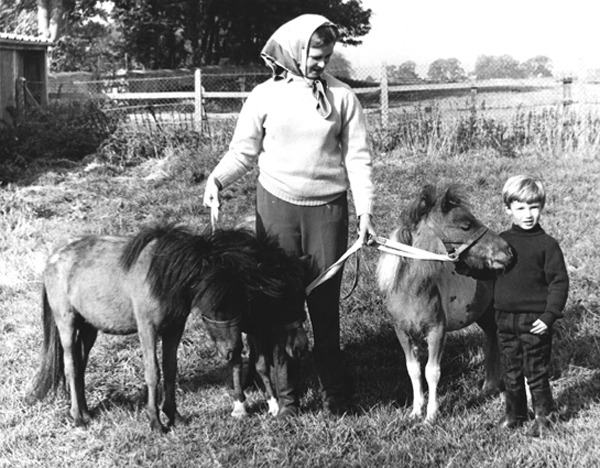 The Lady Rosamund Fisher with Falabella Carlos (left) and Falabella Morenita, dam of Tripoli of Kilverstone. 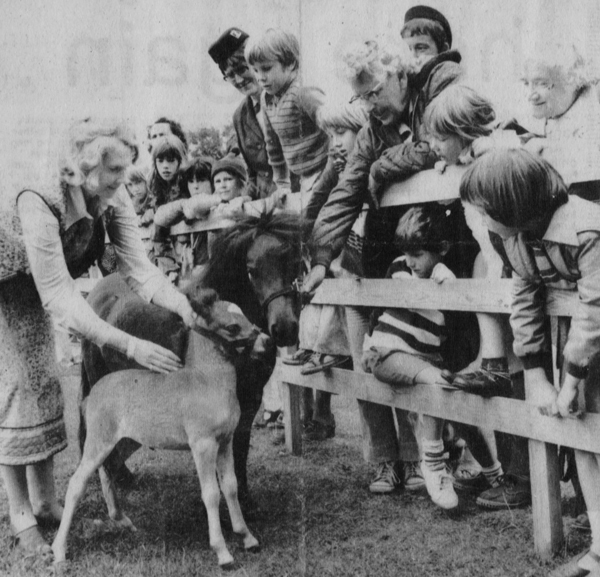 Lady Fisher shows off the first of her Falabella foals to some of the visitors to Kilverstone Latin American Zoo. 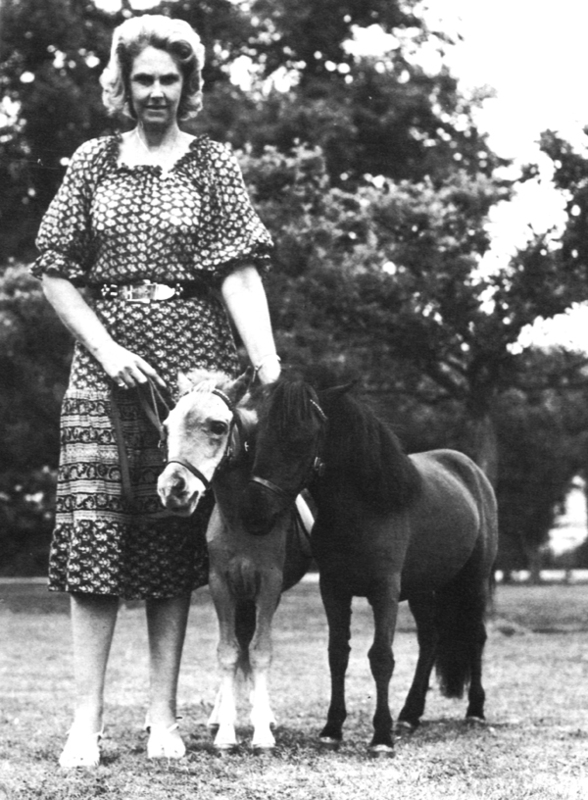 Falabella Pepita with her filly Evita of Kilverstone, by Falabella Menelek. 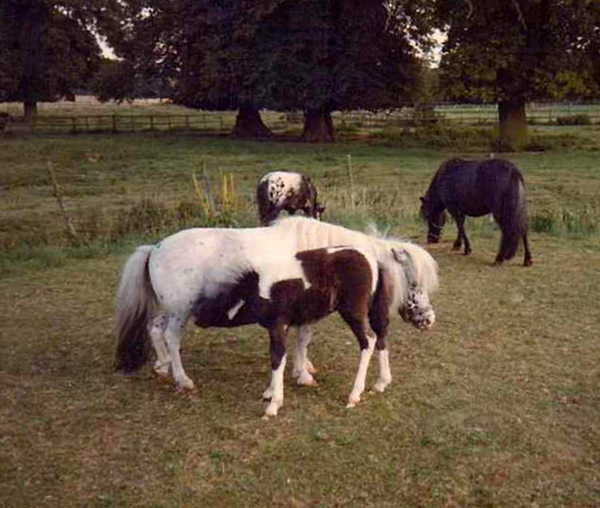 Falabella Morenita, Falabella Tobiana, and Falabella Julio Cesar, 1978.
meaning that they were not only pure bred Falabellas but also American Miniature Horses. Note. 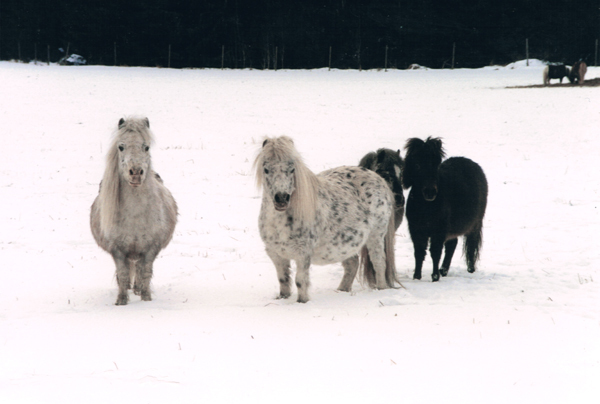 at the time of this photo they were very young horses. 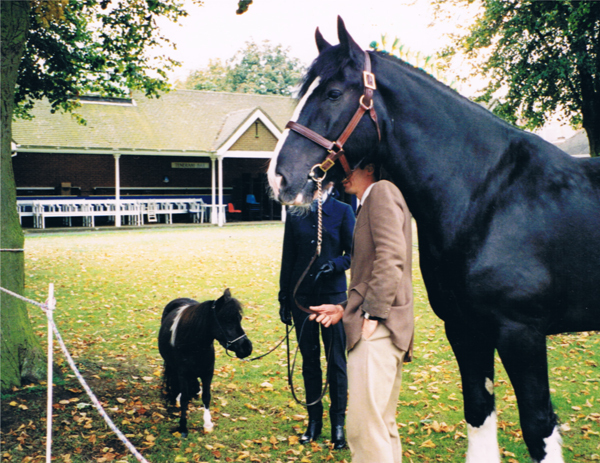 Isadora of Kilverstone and Falabella Julio Cesar. 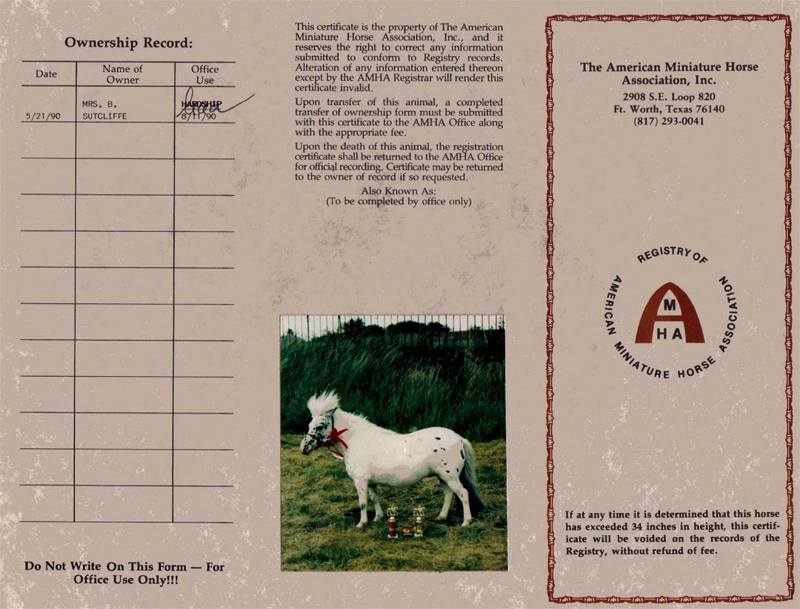 but also an American Miniature Horse. 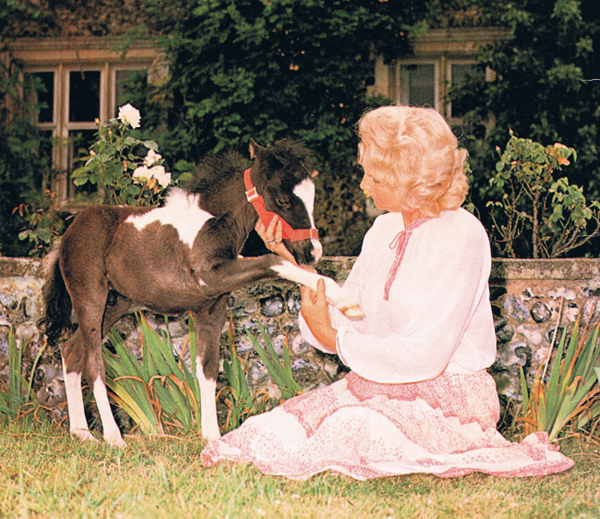 'Chico is 30.5 inches tall, produces lovely foals and, after Menelek, was Senor Falabella's favourite as replacement stud'. 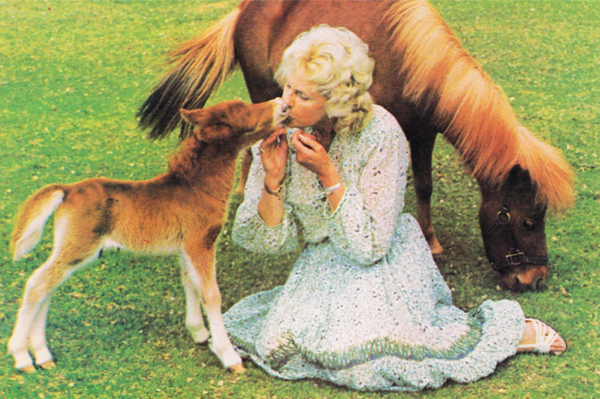 Falabella Argentina (by Falabella Birulak ex Falabella Residente) and foal Red Rumba of Kilverstone with Lady Rosamund Fisher 1980.
but also American Miniature Horses. 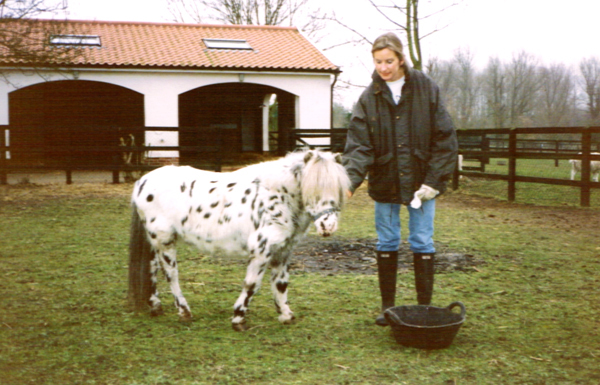 Falabella Menelek (at approximately 30 years of age) with Sue Eckholdt at The Equuleus Falabella Stud in 1991.
who imported six Falabella horses from Argentina 1990-1992.
but also an American Miniature Horse - see below. 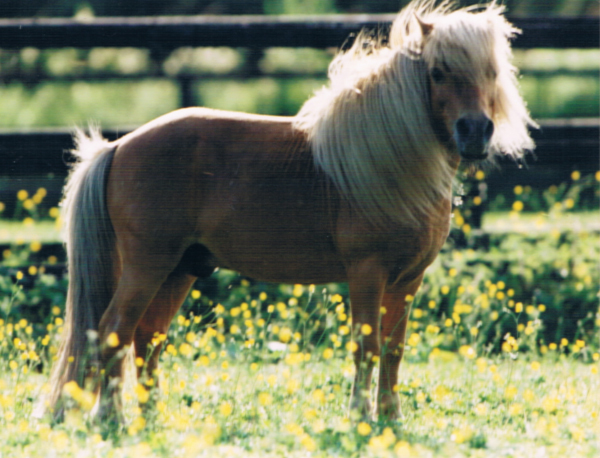 Although the Falabella was significant in the development of the American Miniature Horse, it was by no means the only source. the dam of Limelight's Sabre and Limelight's Point Break.